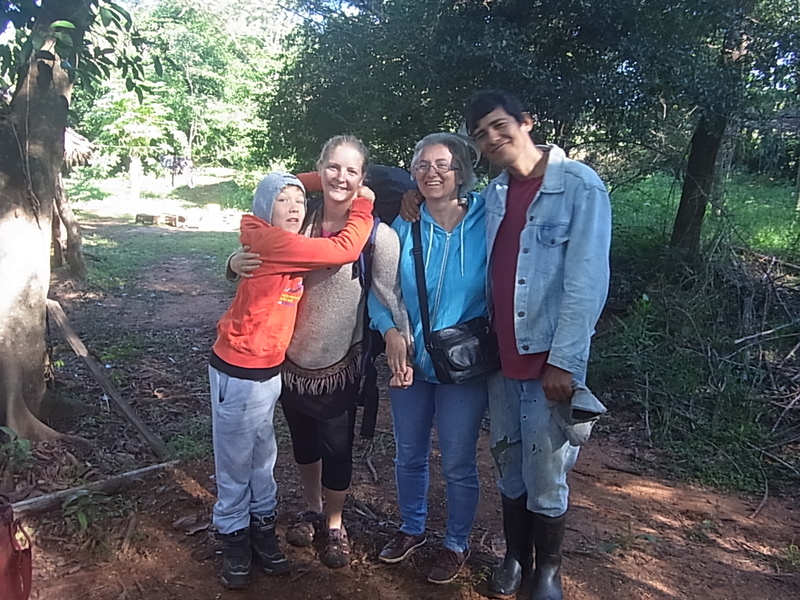 When we finally leave campo, we have an emotional hard time, Brigitte and Lucio and Patricio have become good friends in the last 7 weeks. 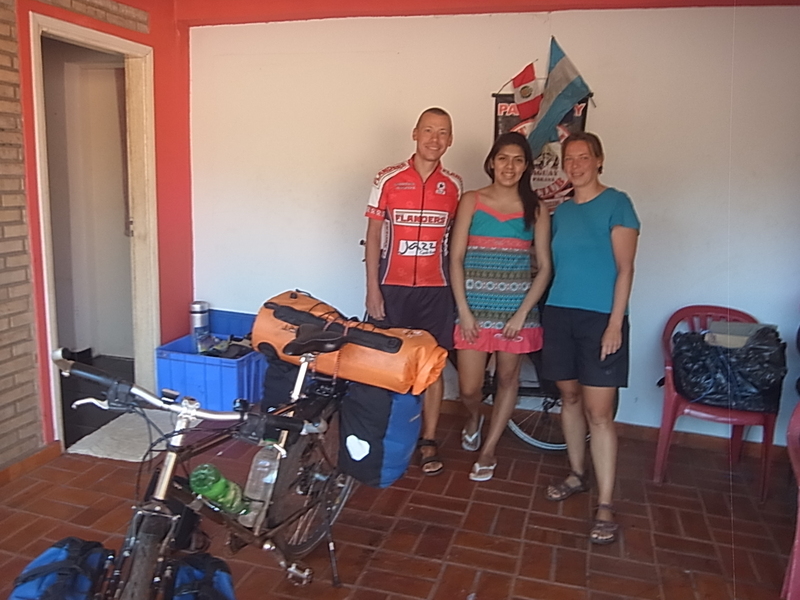 We cycle the 4km to the Ruta 2, meet up with Brigitte who brings us our luggage with the motocarrito and after the last good-bye we cycle on through the Cordillera. Cycling is not easy, we are not used to it anymore and the hills make us tired very fast. 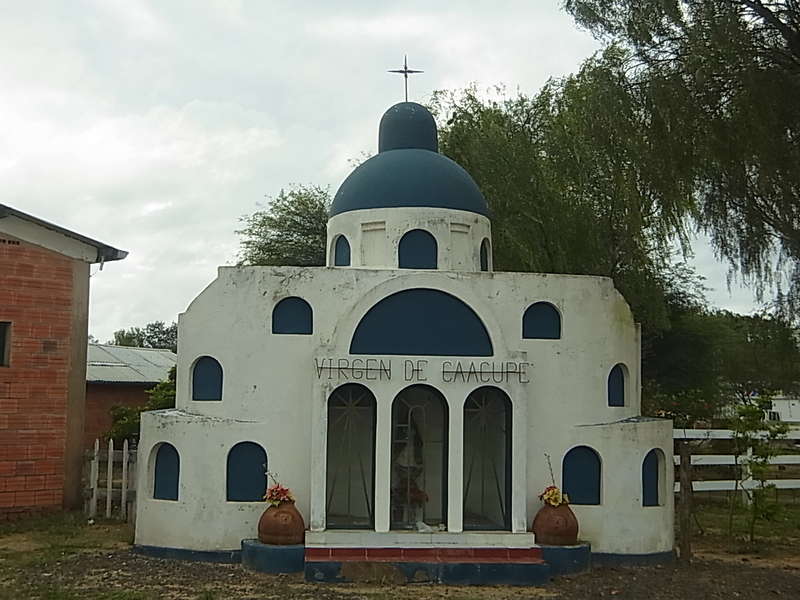 In Caacupe, 30km further, we take our siesta in a park for pelgrims and visit the very famous cathedral of Caacupe. There are lots of pelgrims and once a year, on the 8th of december the whole town is occupied by them for celebration of the birthday of the “Virgen de Caacupe”. 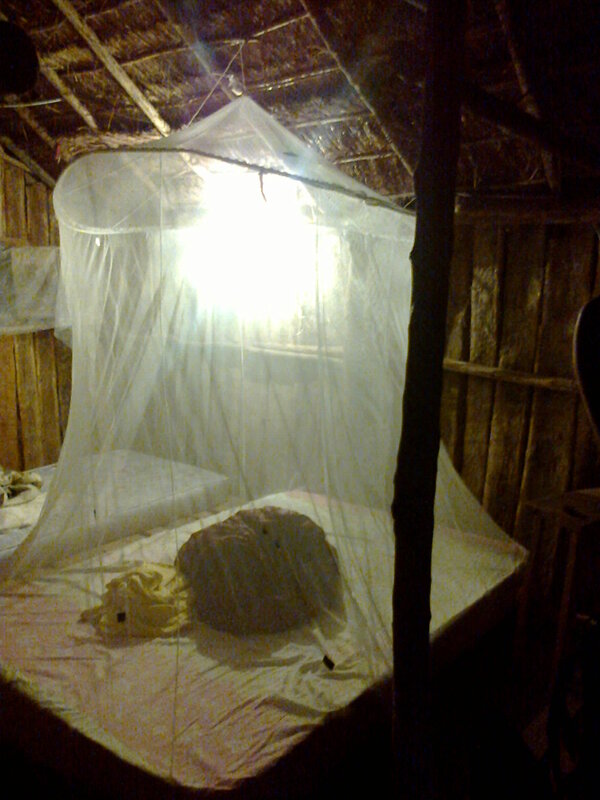 During the afternoon weather changes for the worse and we decide to camp in the Pelgrims´ refugee. 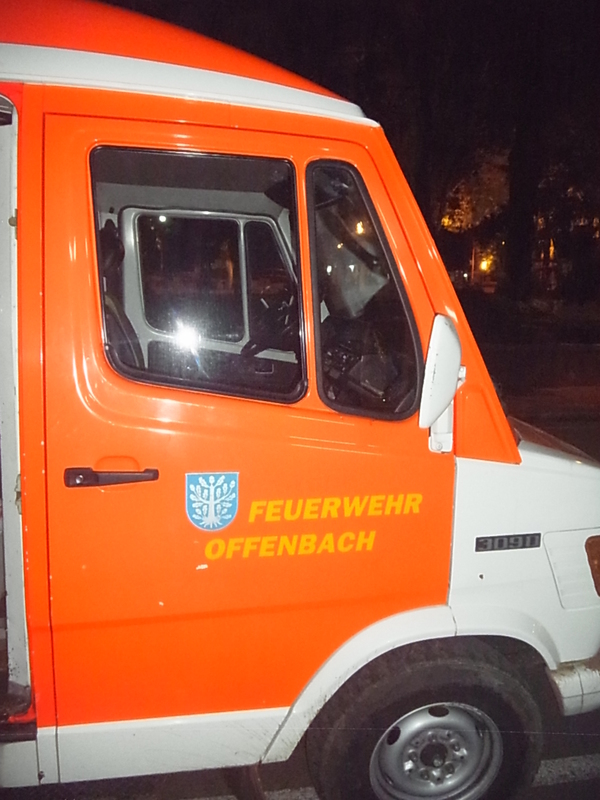 Not our best decision, the man who looks after the property is a drunk and a lonely one as well. As soon as he sees us he starts talking and it´s always the same story, so finally we have to go very early into our tent to avoid him. 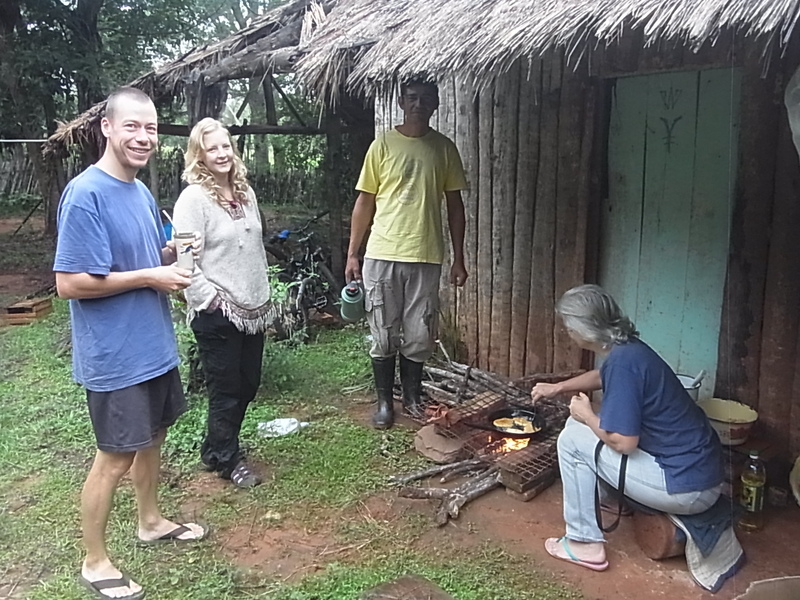 The next morning we have to search a hostal anyway, it seems winter has actually come to Paraguay and that means lots of rain, accompanied by cold wind from the South. Temperature drops under 10°C and we leave the Hostal only to buy some food. But than, two days later we´re off again. 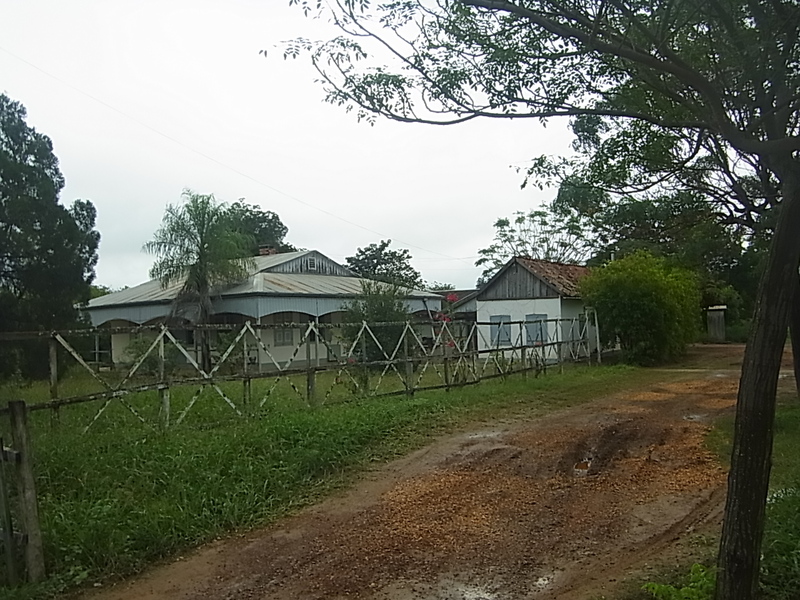 We cycle along the banks of the Lago Ipacarai, a region with a lot of german and austrian inhibitants. During our time at the campo we already visited San Bernardino, a small village near the lake with a german market on Saturdays. 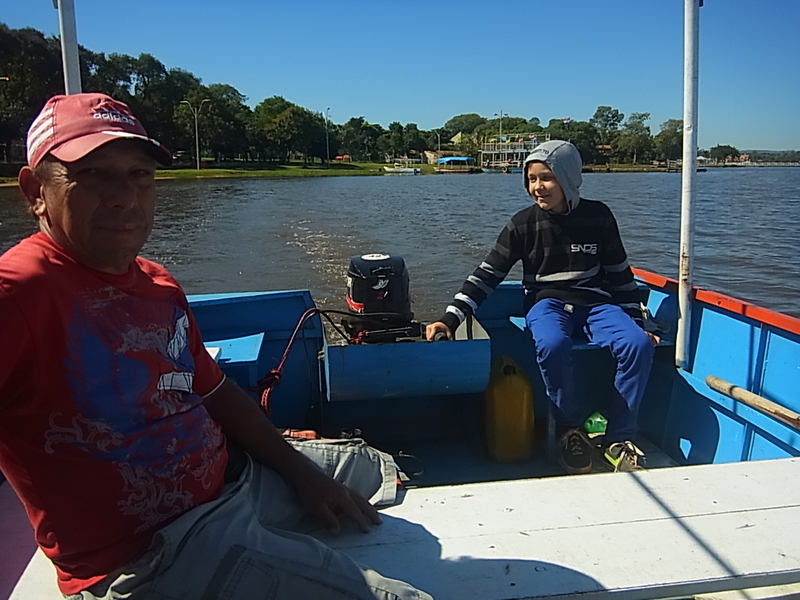 We made a boat trip on the lake with Patricio and then went to the market. 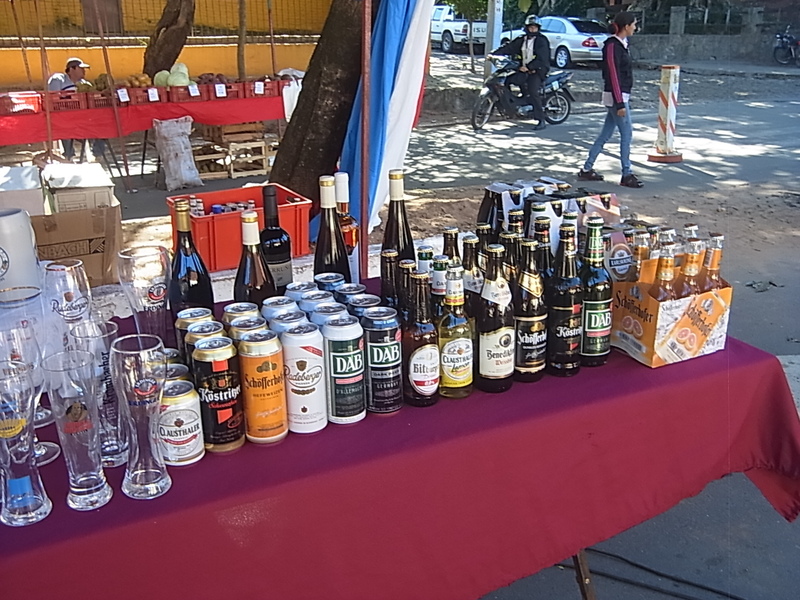 It was a little bit strange to hear people talking german and see all the german products around (even some unexpected ones), but it was also very delicious: german sausages, bread and cake, fried potatoes with onions and bacon and even beer from bavaria (officially that´s also Germany 😉 ). 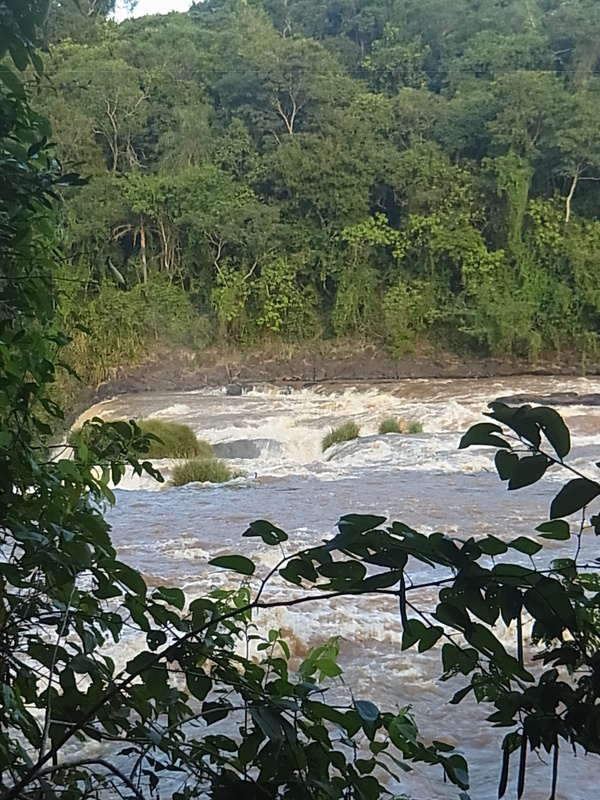 Than have a last look on far away Asuncion from the bridge as we cross the Rio Paraguay and finally arrive in Villa Hayes, the entrance to the Chaco. 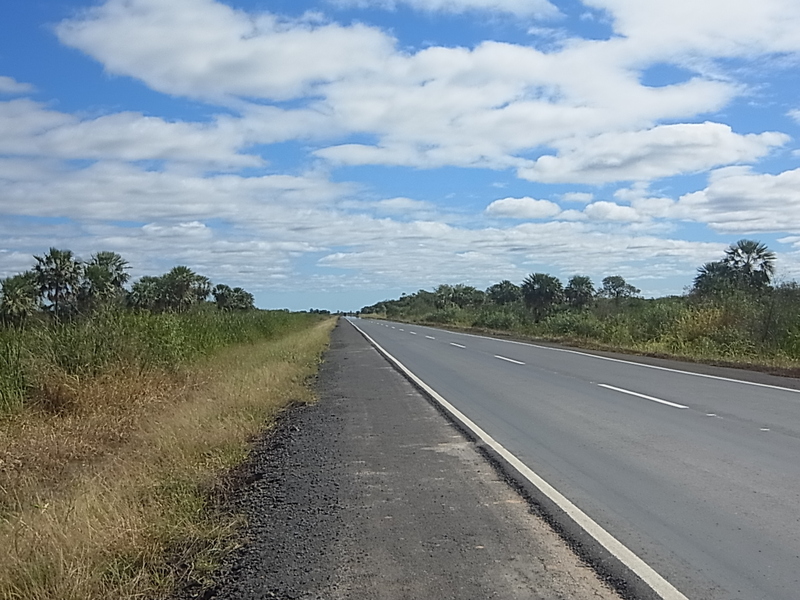 On the planned first full day of riding the Trans-chaco-road we buy some food and water, and are off under a blue sky. 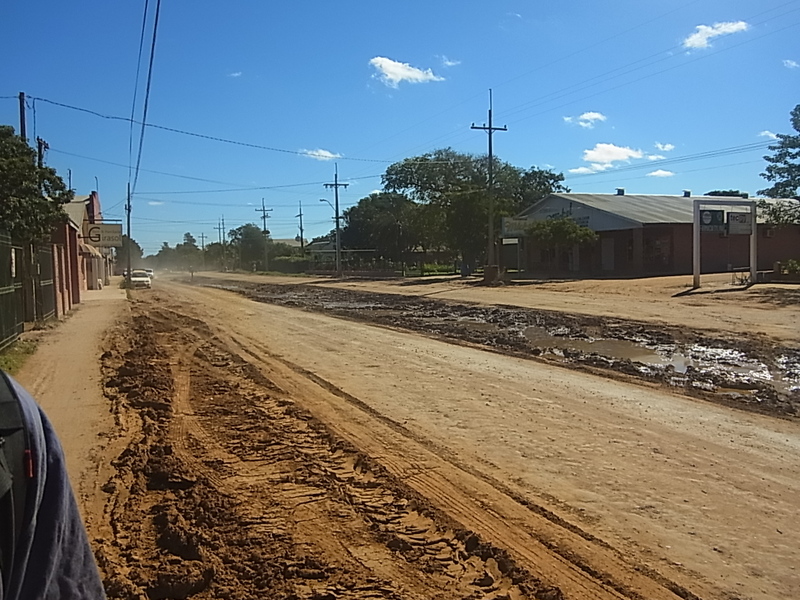 Three hours later instead of three days we get out in Pozo Colorado, a big crossroad of two main streets and now a big area of mud due to a lot of rain for the last two weeks. 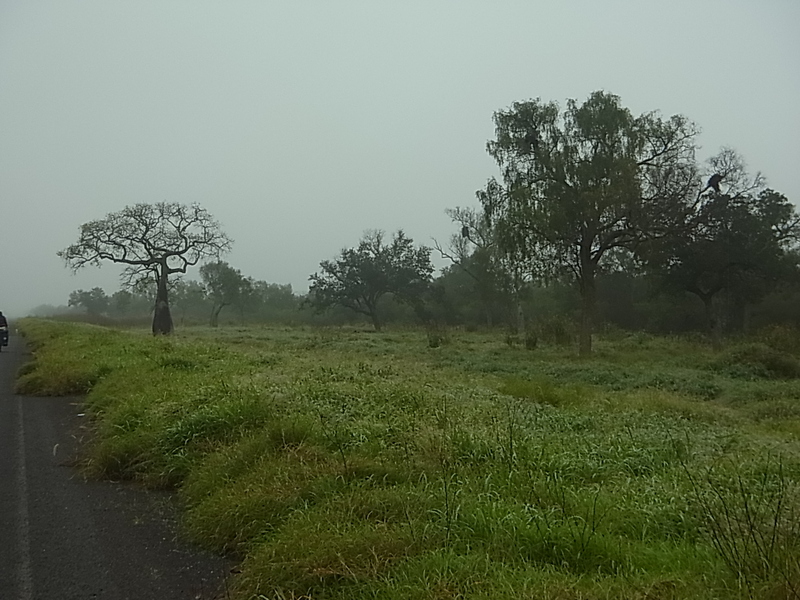 We don´t know it yet, but rain like this comes only every ten years to the Chaco and then changes the whole area from bottom to top. For the moment we work our way out through the mud and happily start cycling along the eternal straight road. 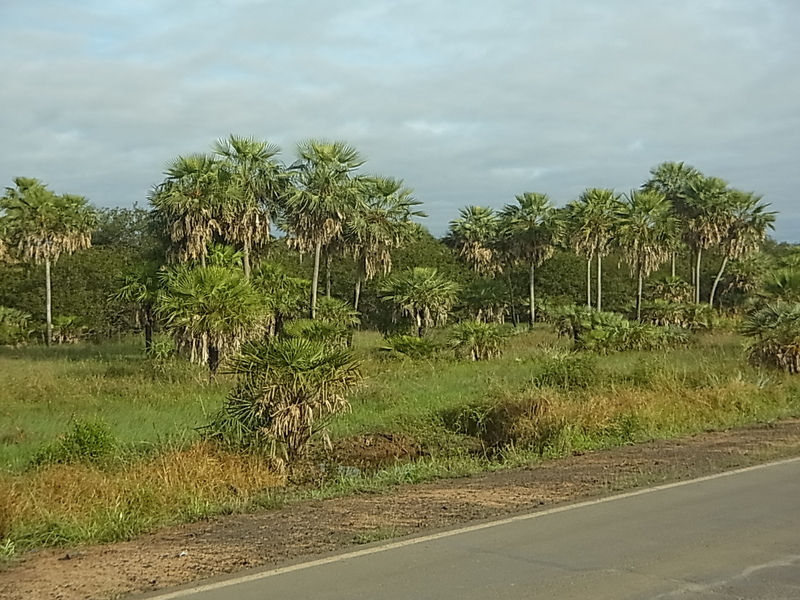 We pass huge areas with palms, everything around is green and sometimes it seems like we pass a sea because of flooded areas left and right to the street. 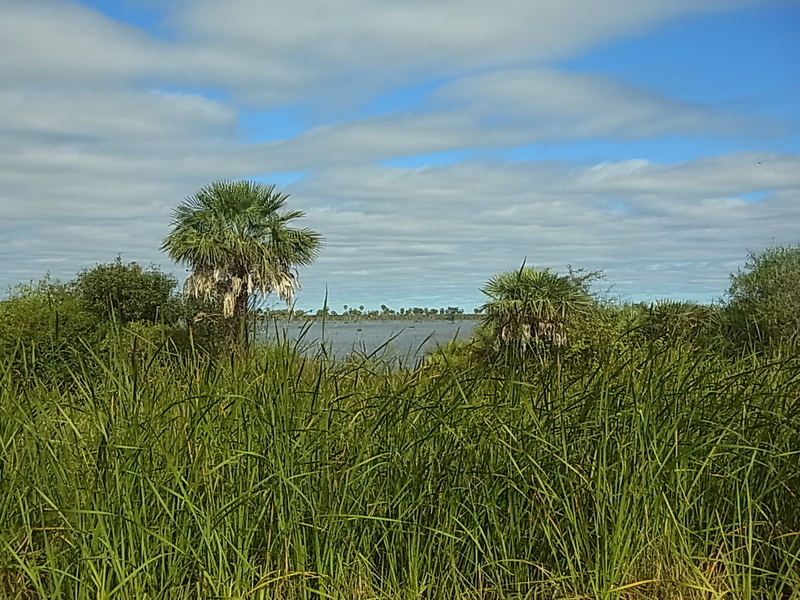 We spend the second night in Cruce Los Pioneros, 75km further, where we can put up our tent in the garden of the local hotel (the hotel itself being too expensive) next to a small lake. 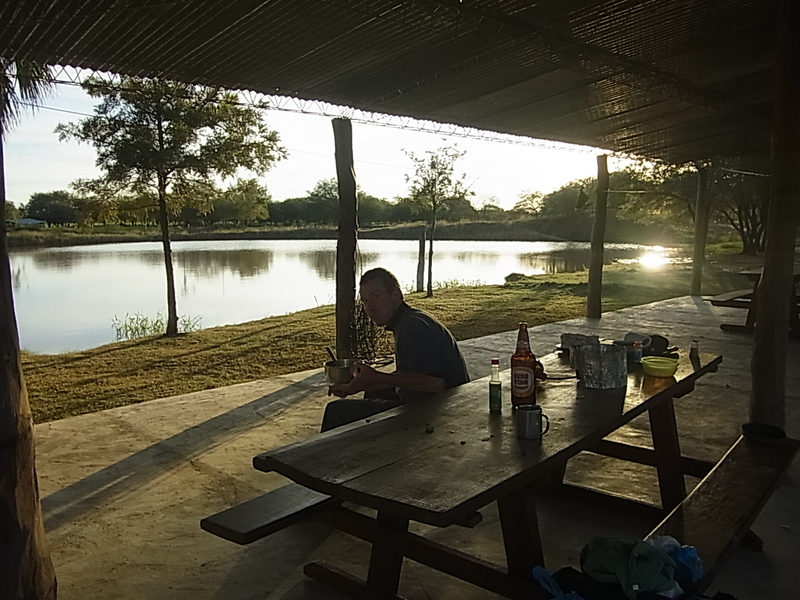 We cook our own meal, buy some beer and watch the beautiful sunset. 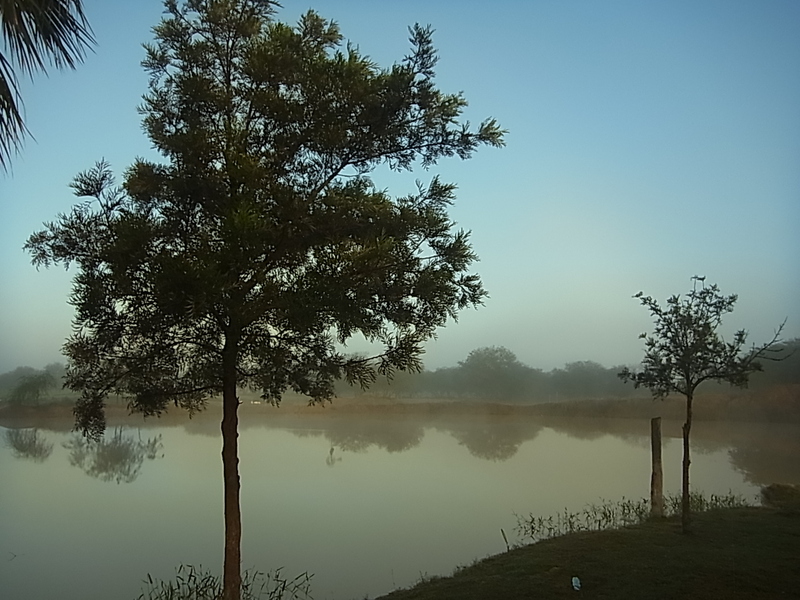 Same place but different the next morning, mist came up and it takes two hours until the sun burns it away. 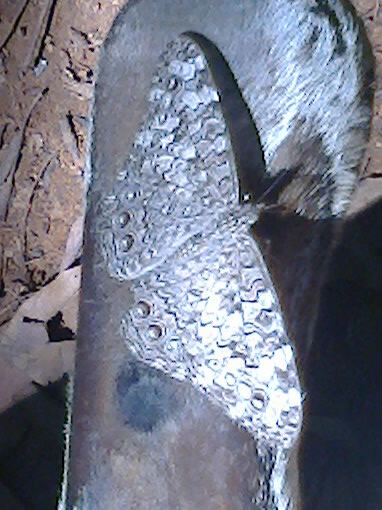 Up to now the Chaco is not really a big challenge but a nice experience. 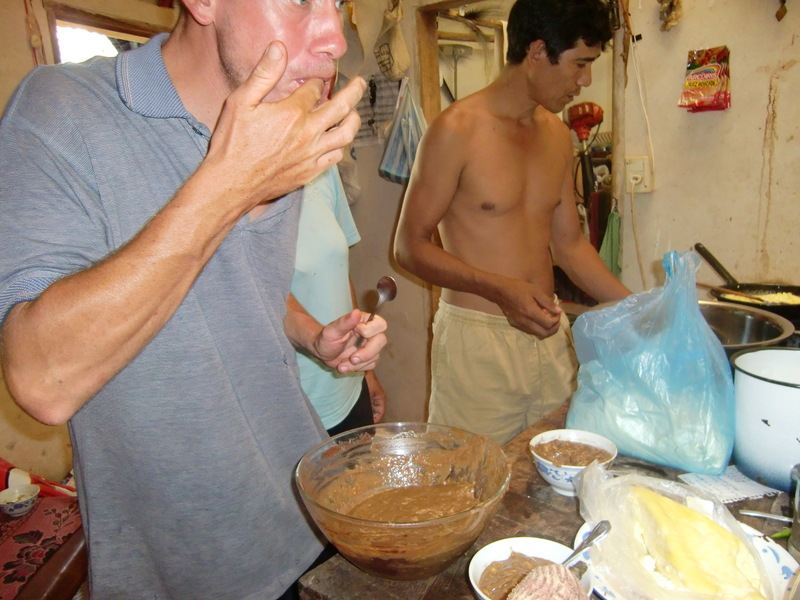 The third day we reach the Mennonite area around Filadelfia, the biggest town in the middle of the Chaco. 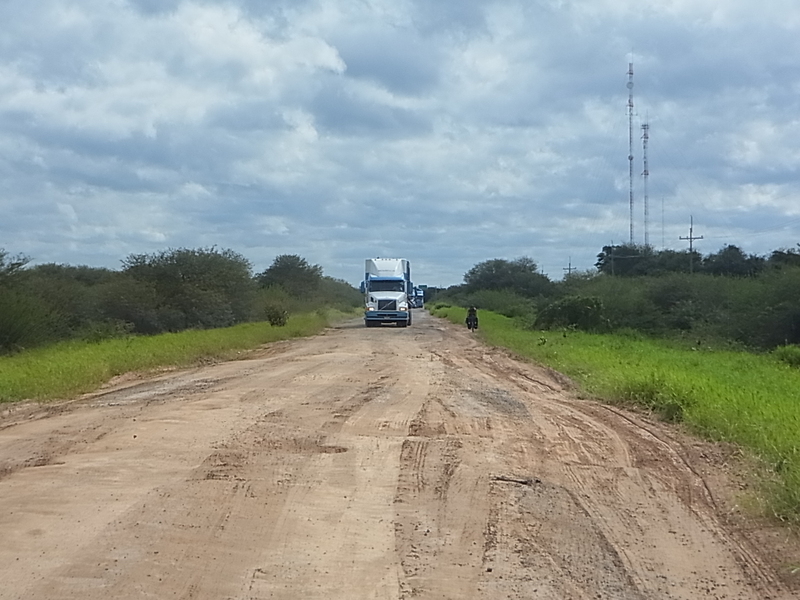 At Cruce Calvet, where the road to town leaves the Trans-Chaco road we are called by a man from a small despensa. 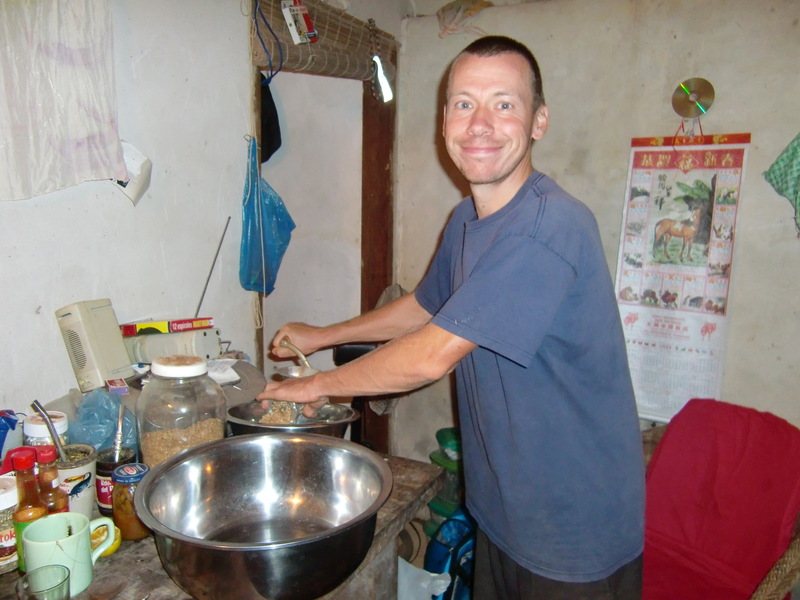 It turns out that he is one of the local Mennonites, speaks fluent german and is very kind. 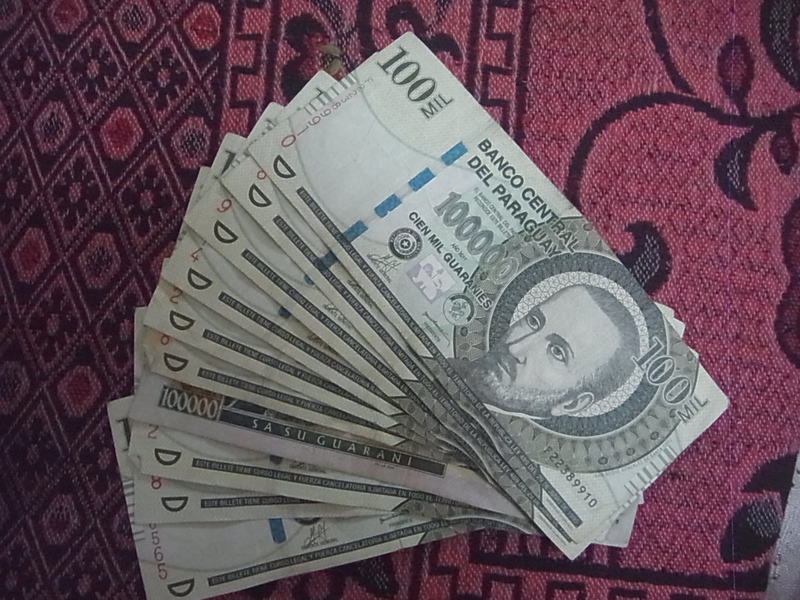 He proposes that we camp next to the despensa instead of going to Filadelfia and save a lot of money since Hospedajes in town are outrageously expensive. 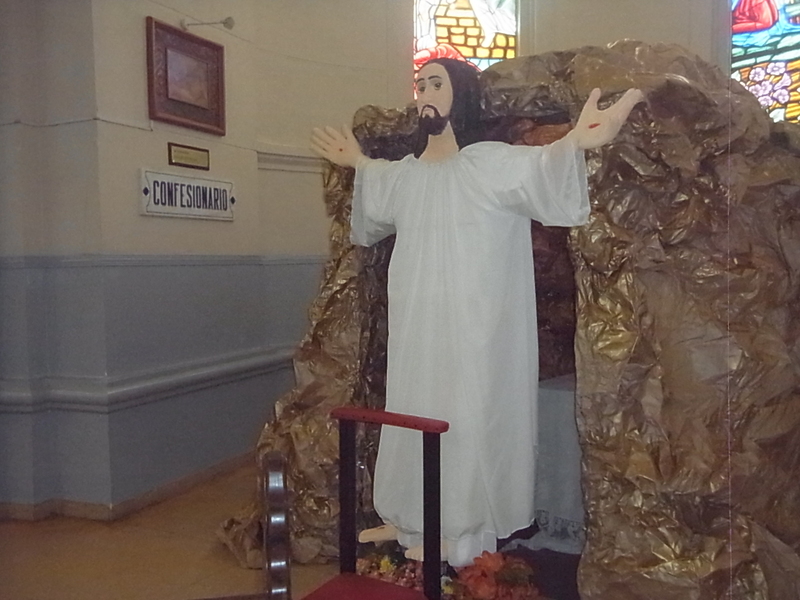 We accept the invitation, and in the afternoon visit Filadelfia, some 17km away, by car-stop. 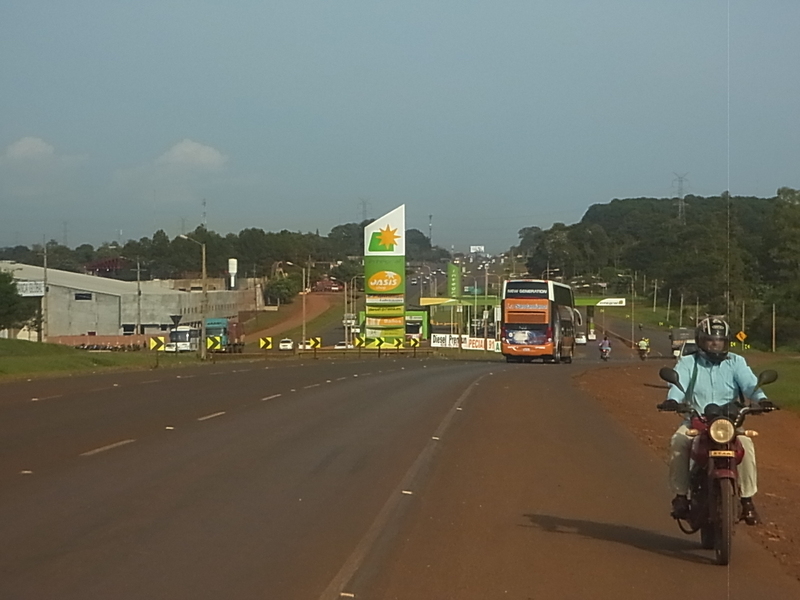 The town is smaller than expected, very dusty and not very invitational to strangers. 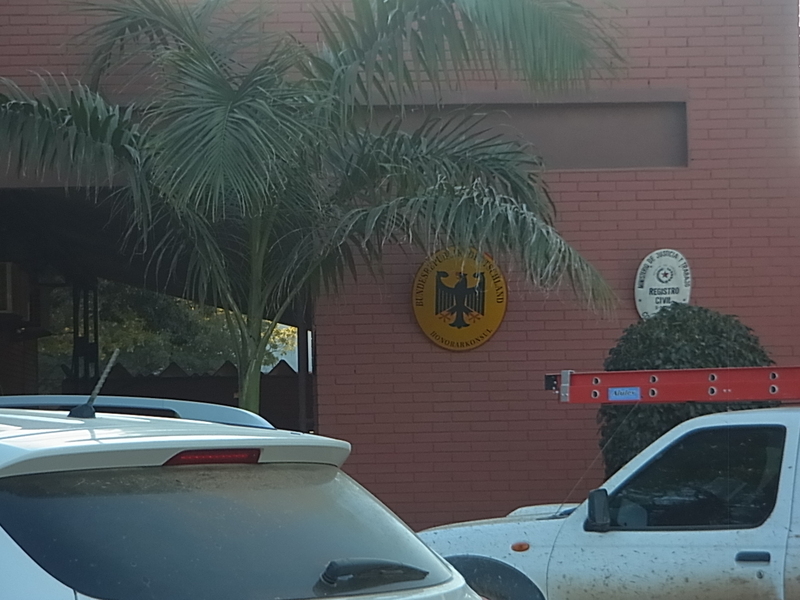 But since it´s founded and dominated by Mennonites, nearly everybody speaks german, road signs are bilingual and the supermercado sells a great number of german products (including chocolate). 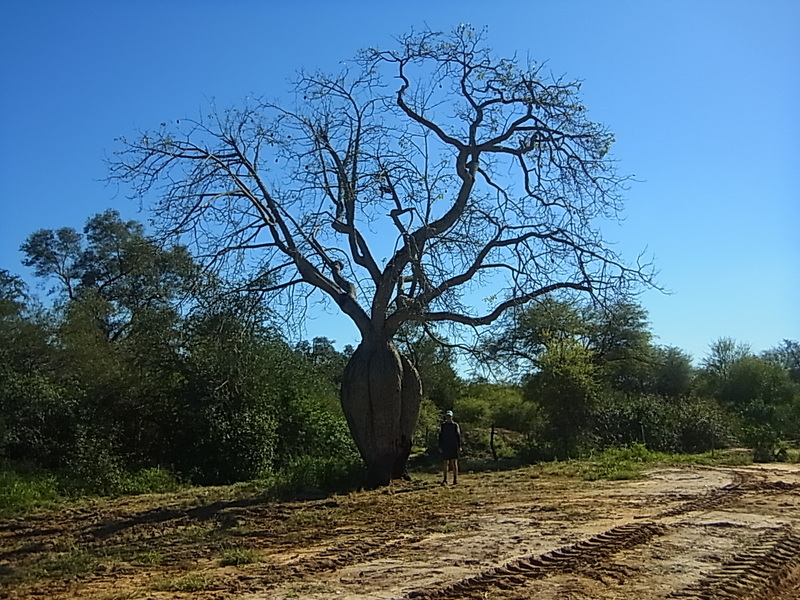 So the next day we first visit Blumental and Hohenau, two small nearby Mennonite settlements and in the afternoon drive with Helmut to Neuland with his Pick-up and our stuff in the back. The settlements are like visiting small villages in Germany. 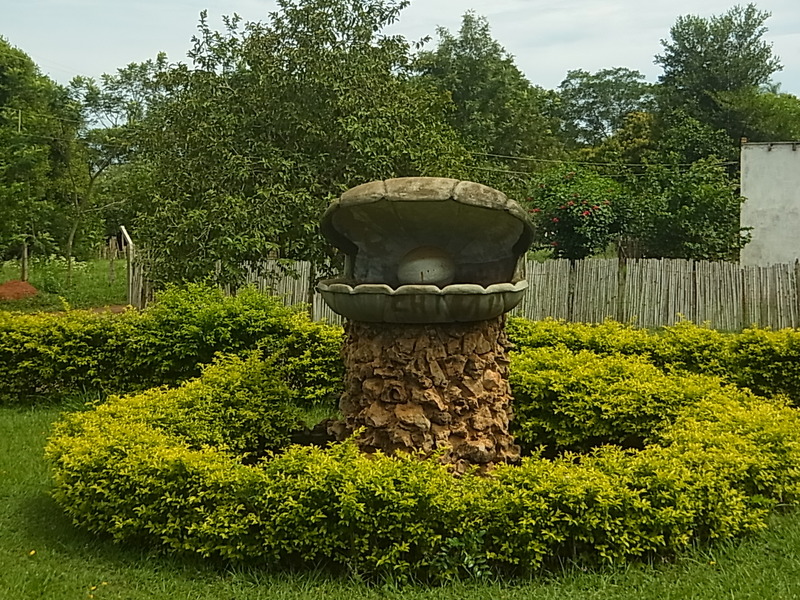 Nice houses, maintained gardens, everything clean – and also very quite. 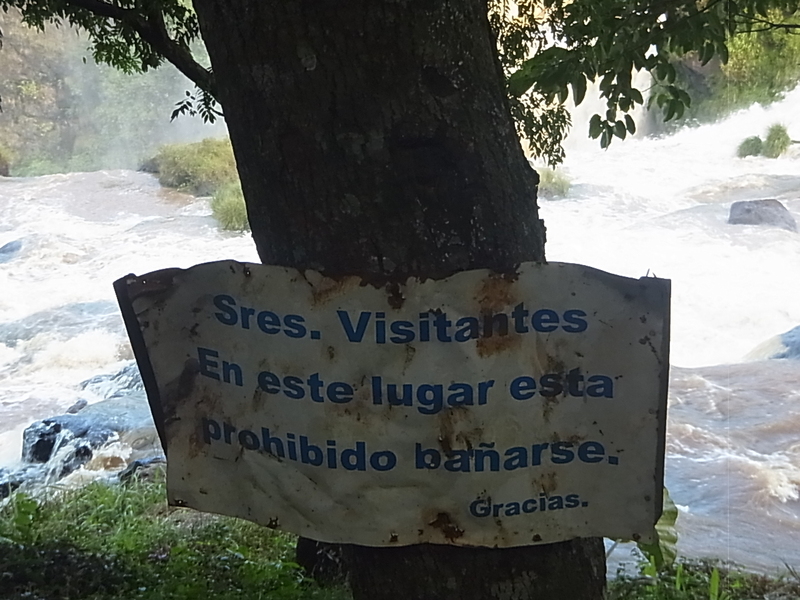 No people on the streets, no music in the houses, nobody drinking Mate on the veranda – somehow strange in South America. Neuland than is quite bigger and more lively. 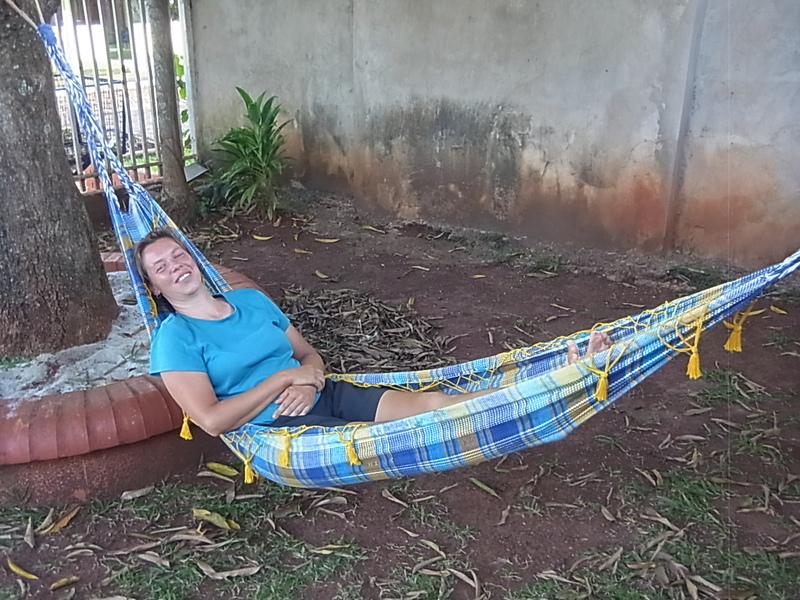 We stay at Helmuts´ place and get to know Helmuts´ brother and sister, visit the german “Honorarkonsul” and the Headmaster of the local Colegio and learn a lot more about the Mennonites, their past and their present situation in Paraguay. 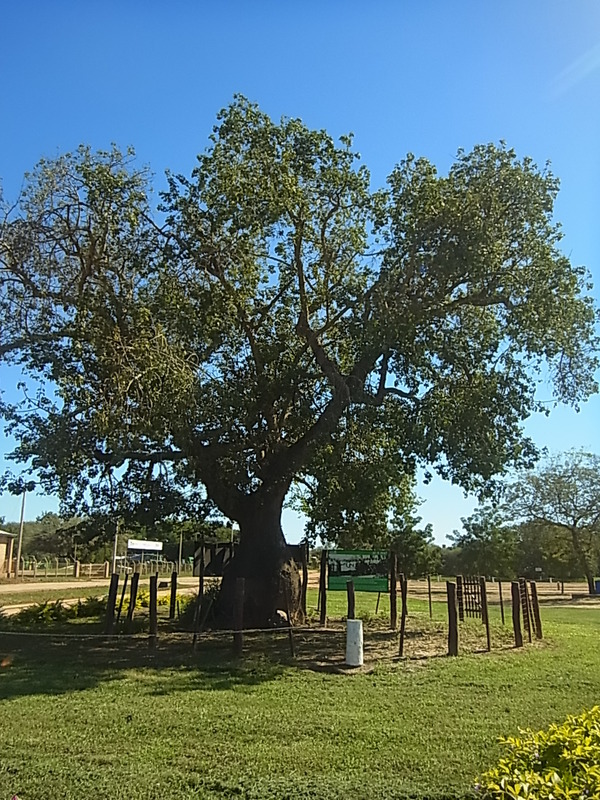 We also visit the “Founders´ tree”, where 60years ago the community was born. Six days go by and on our last day it´s us who get questions asked, by Helmuts´ nephew Oswaldo, in an interview for the local radio and newspaper. 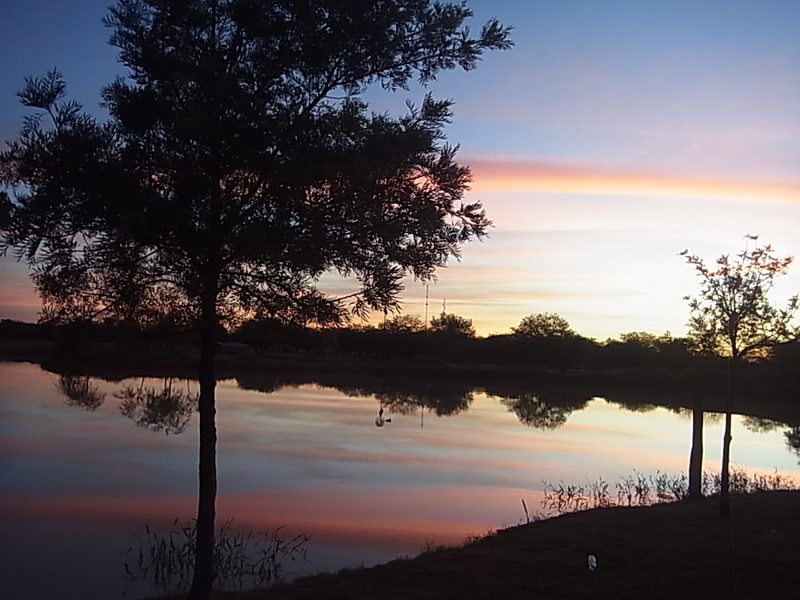 Then it´s the second time we leave a place in Paraguay with mixed feelings. Even if it was only one week, we have once more made friends and get a glimpse into the lives of this special community. 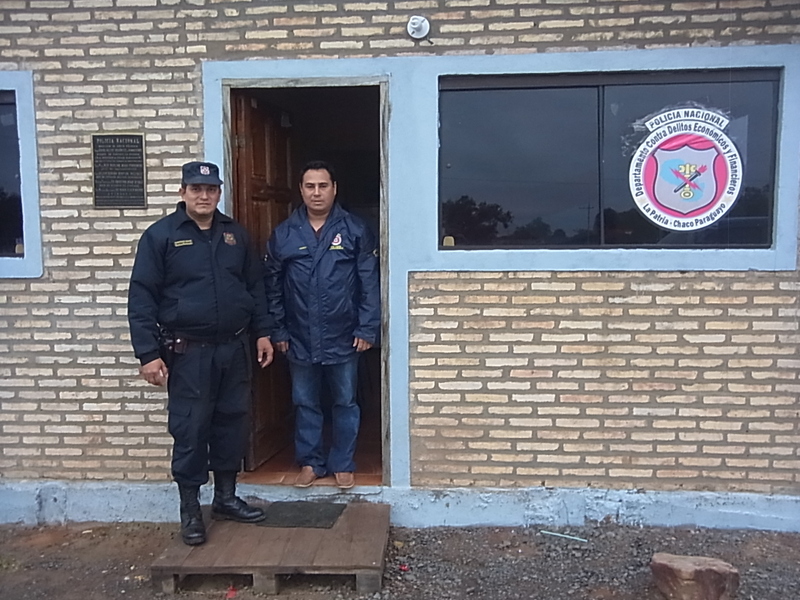 Next stop on the Trans-Chaco is Mariscal Estigarribia, where the migration office for leaving Paraguay is located. The officer offers us a room and proposes to take the bus to Bolivia because of the bad state of the streets. We accept the first but decide to cycle on, now we are determined to leave the country on two wheels! A decision we question several times on the next 120km. 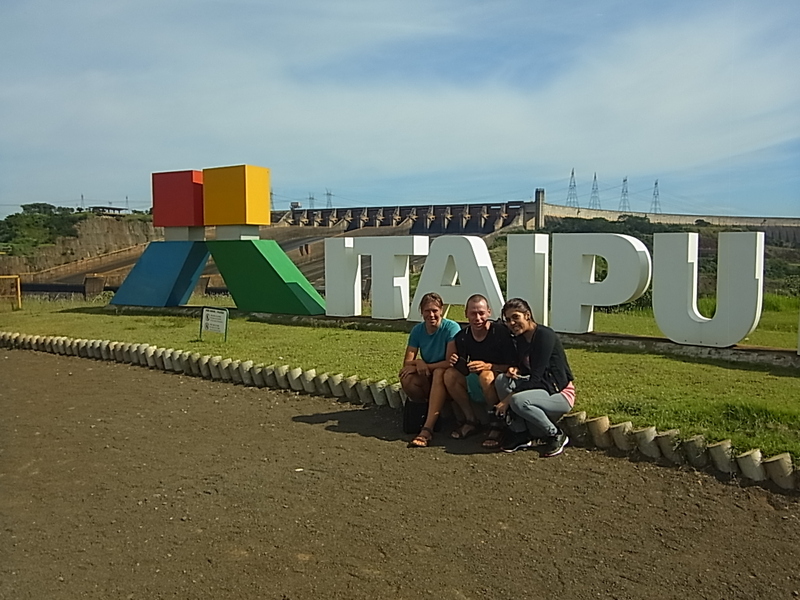 After we get our exit stamp the next morning and have a small flashback to Caacupe, we start in direction of La Patria. And have to find out, that “bad state” is not a sufficient description for the road. The better one is, that there is nearly no road anymore but stretches of stones, deep holes, sometimes muddy, sometimes sandy and from time to time a few last pieces of asphalt, as a remembrance of former times. 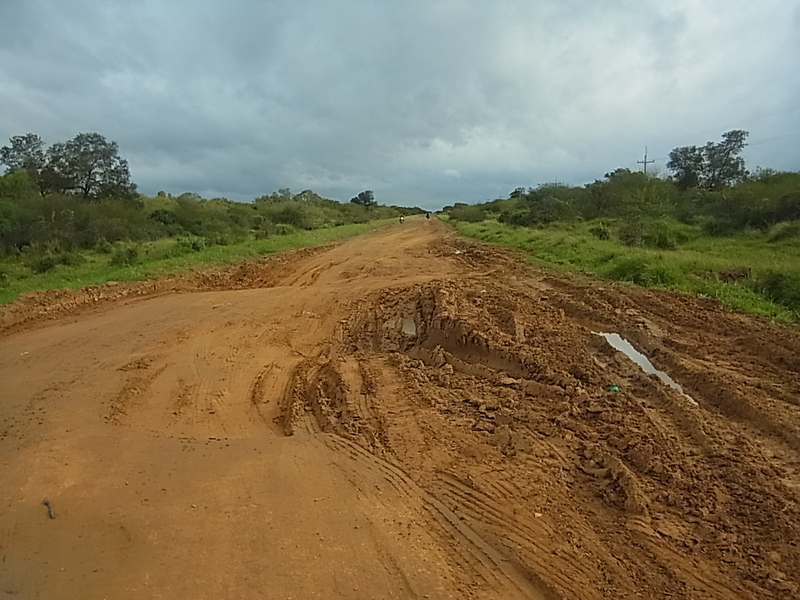 Unbelieveable, this road is used mostly by gasoline trucks since Paraguay buys its gasoline from Bolivia and every liter is imported through the Chaco. 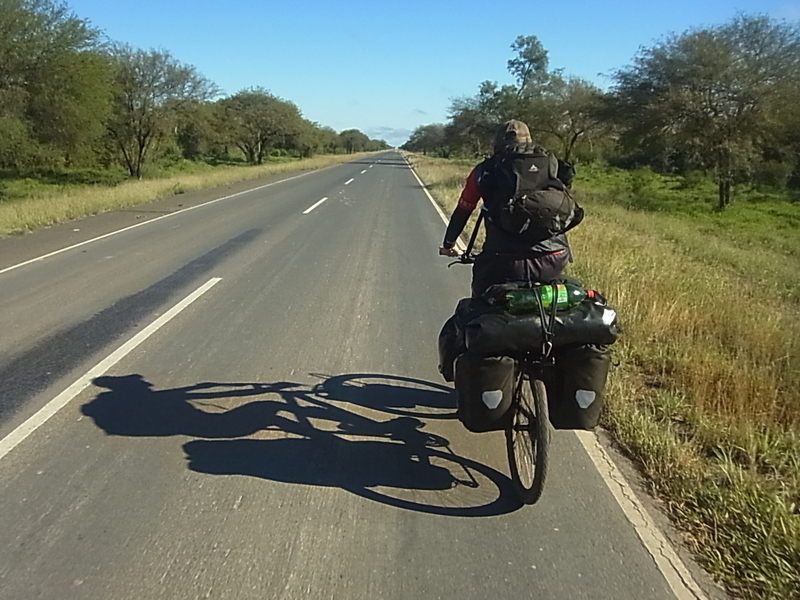 Bram, cycling in front of me, disappears sometimes up to his waist in the holes and it´s a secret to us how the trucks manage this road! 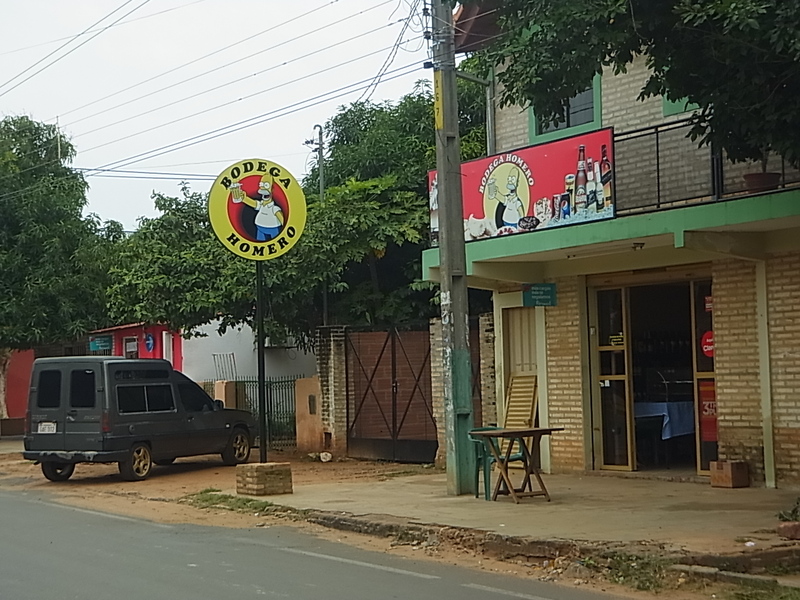 And funny, exactly on this piece of road, the worst imaginable, the name road unworthy, we meet more foreigners than anywhere else. 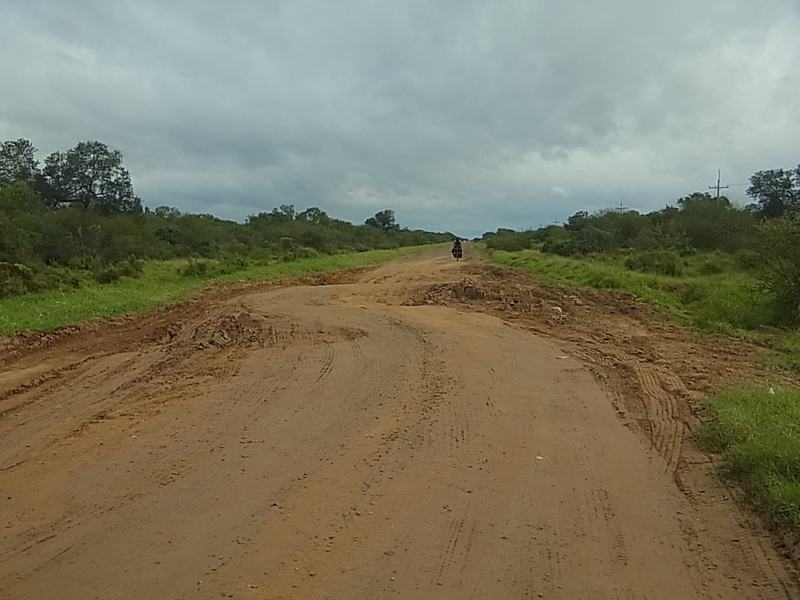 This part of the road is also the most challenging one of the whole Chaco. Cycling an endless road for several days is one thing, cycling an endless road in this bad condition is a different one. 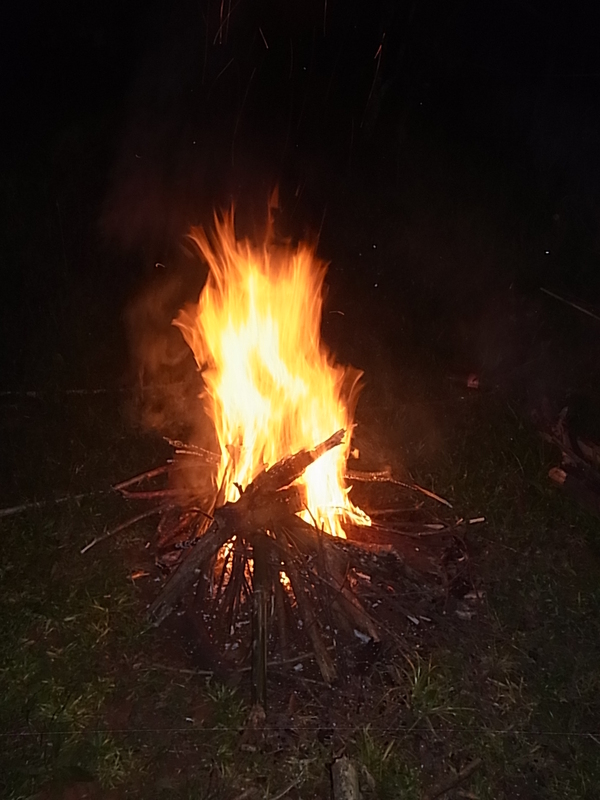 We sweat and sware and fight and though don´t have the feeling to move forward a little bit. The nature, the birds´ singing – nothing helps as long as the horizon doesn´t come closer and only the trip computer shows that we really make km. 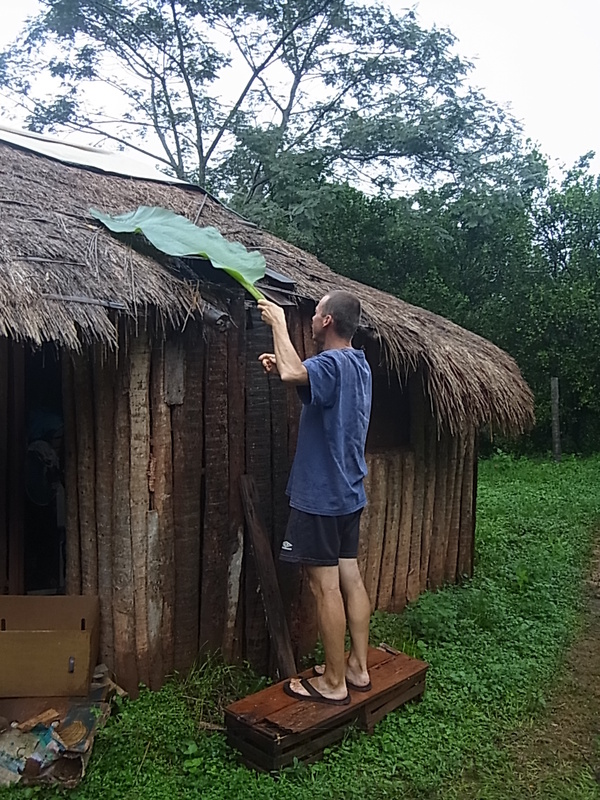 Also, since Mariscal, there are no signs of population anymore and we are very happy to pass the first house (there are only three in total on this 120km) in the evening and find a flat stretch of land for our tent. 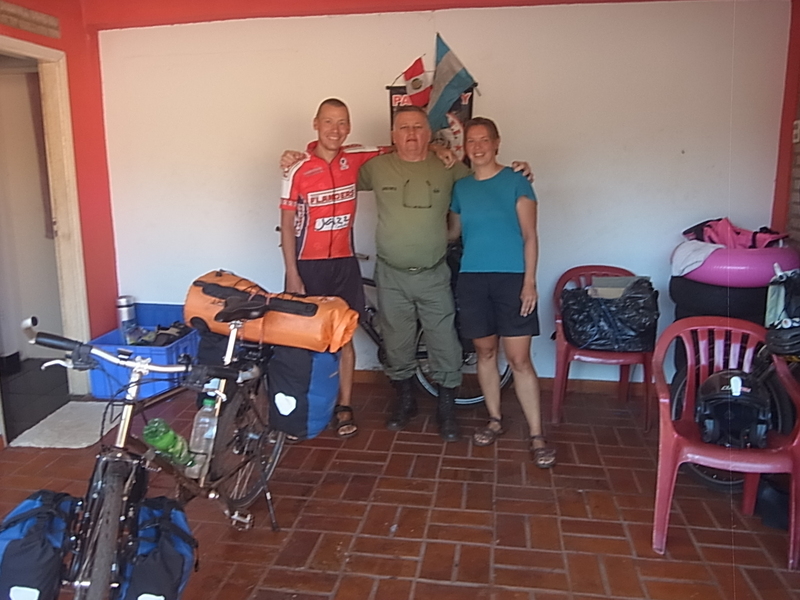 We are more than happy to reach La Patria two days later and get a friendly welcome by the local police who invites us to camp next to their station and use their (cold) shower. 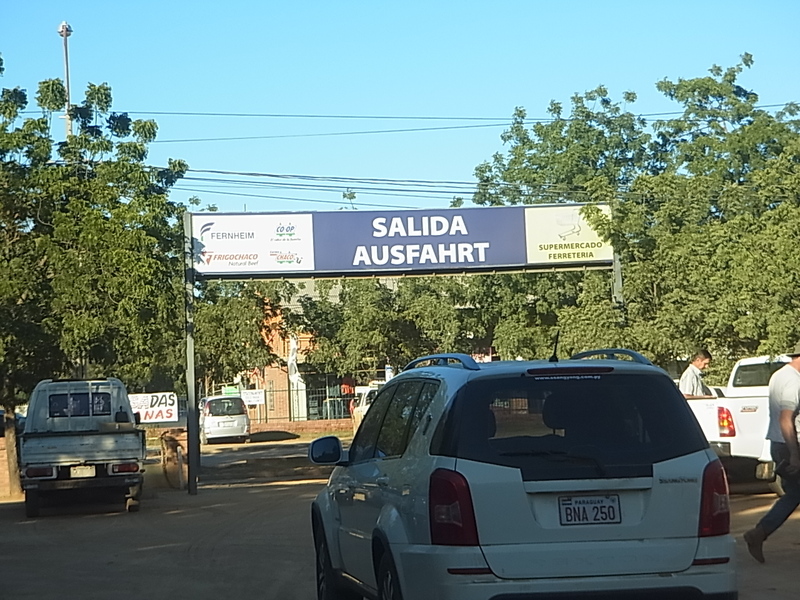 Two days later, on a road which deserves this name again, we reach Infante Riverola at the border with Bolivia. 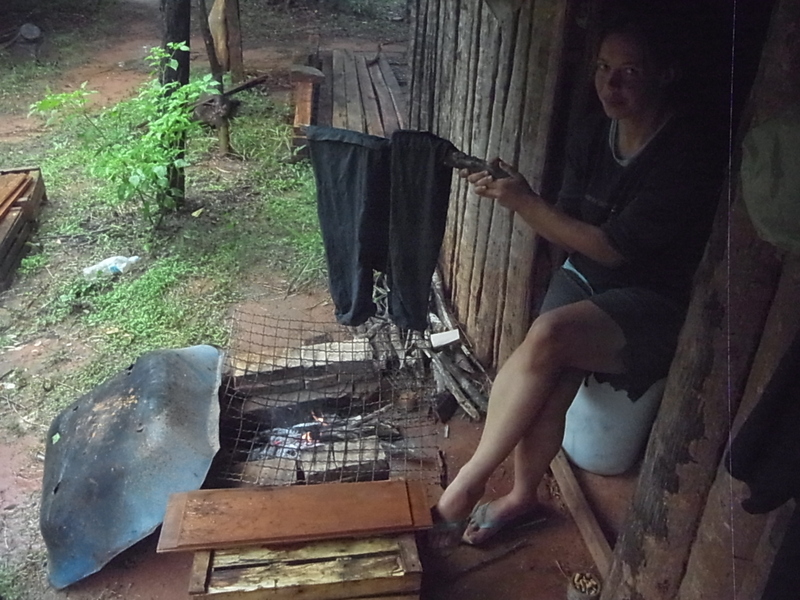 We spend a last night in Paraguay, at the border station 20m away from Bolivia and exit the country the next morning. 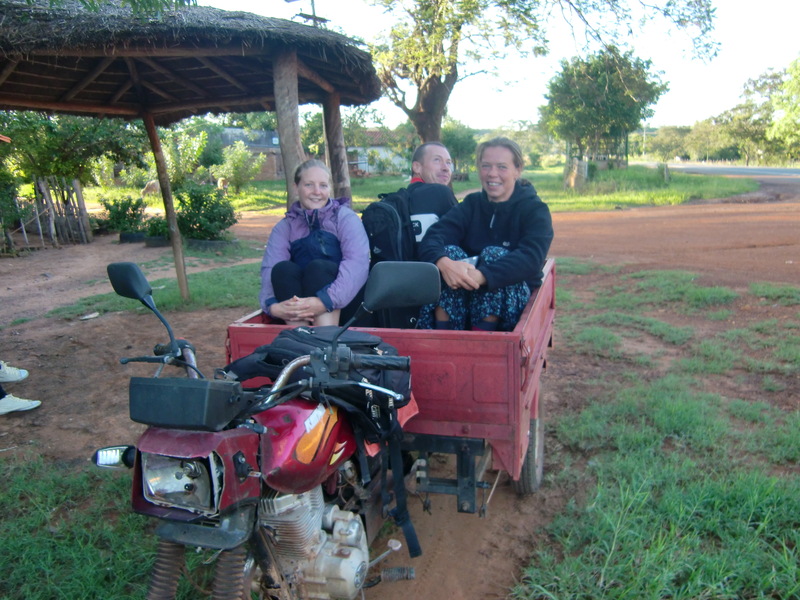 Altogether, cycling the Chaco was an experience we wouldn´t miss. 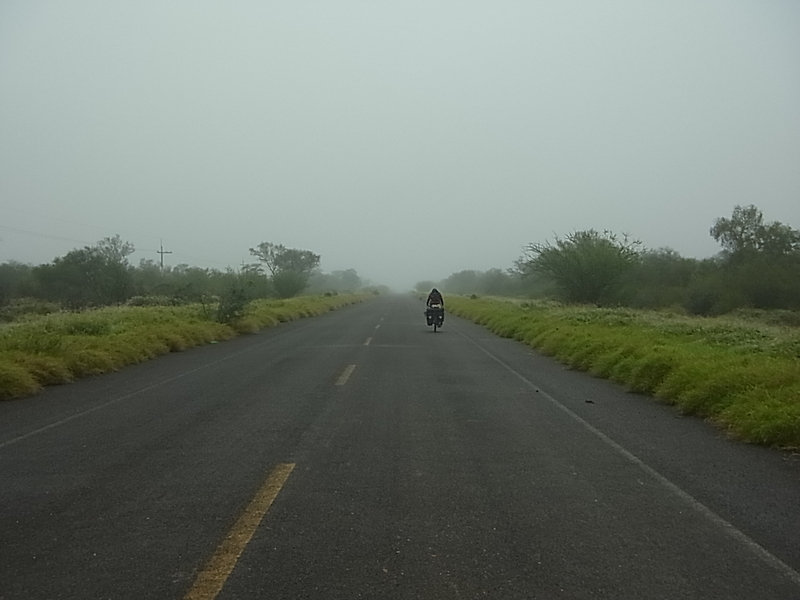 The endless road was sometimes a mental challenge and especially behind Filadelfia there is nearly no population anymore. 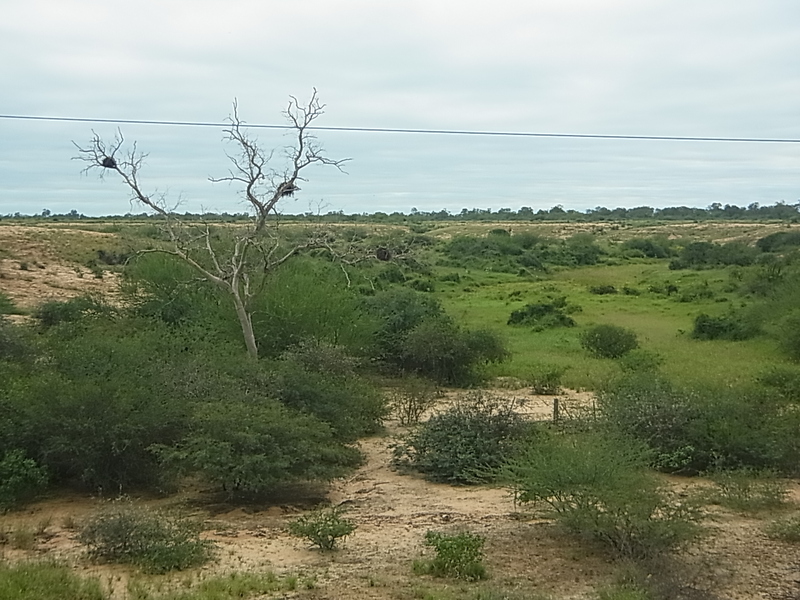 We were lucky and got the chance to discover it after the big rains when everything was green and lively and the temperatures were moderate, not hot and dry and barren like we thought before. But still, it´s a rough part of the country and we admire all people who manage to live there and know now, why there aren´t so many! 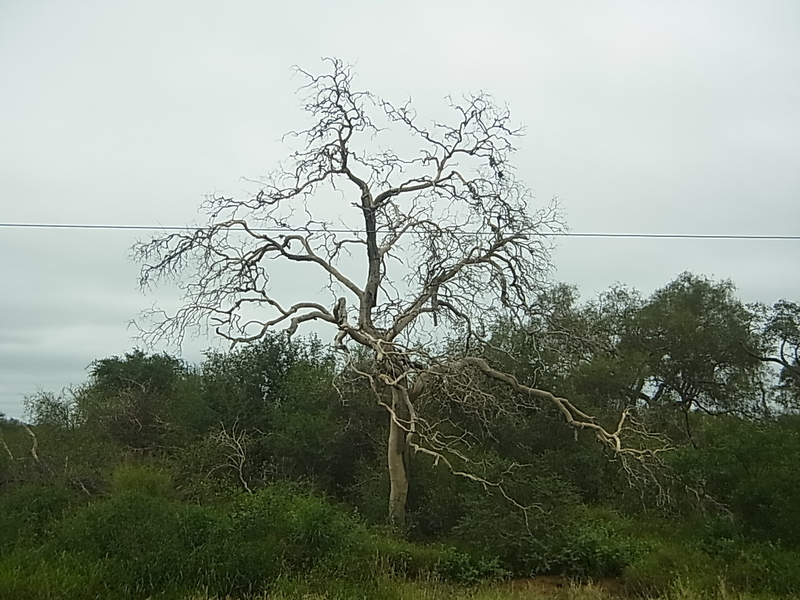 We start our time at the Campo with discovering the surrounding. 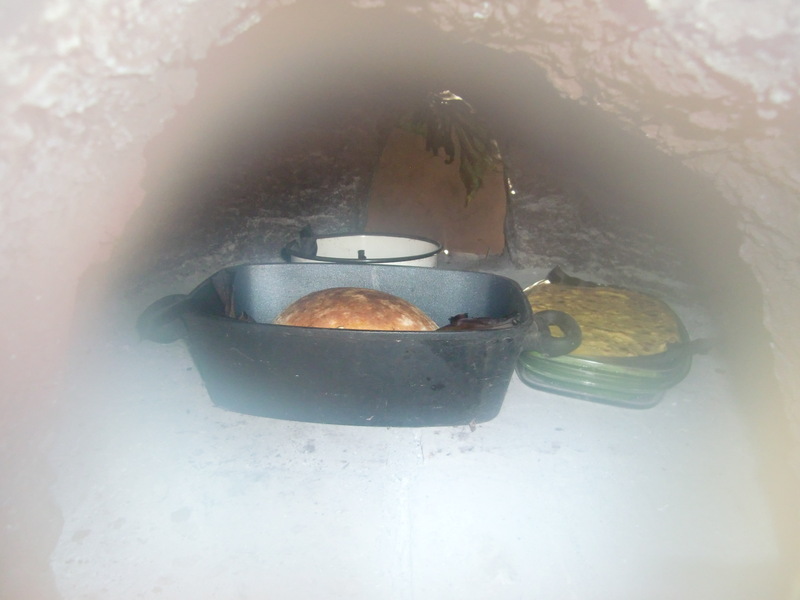 The central point is a round house with a glass roof, six metres in diameter and build halfway into the earth which makes it cool in both ways: temperaturewise and it´s fancy. 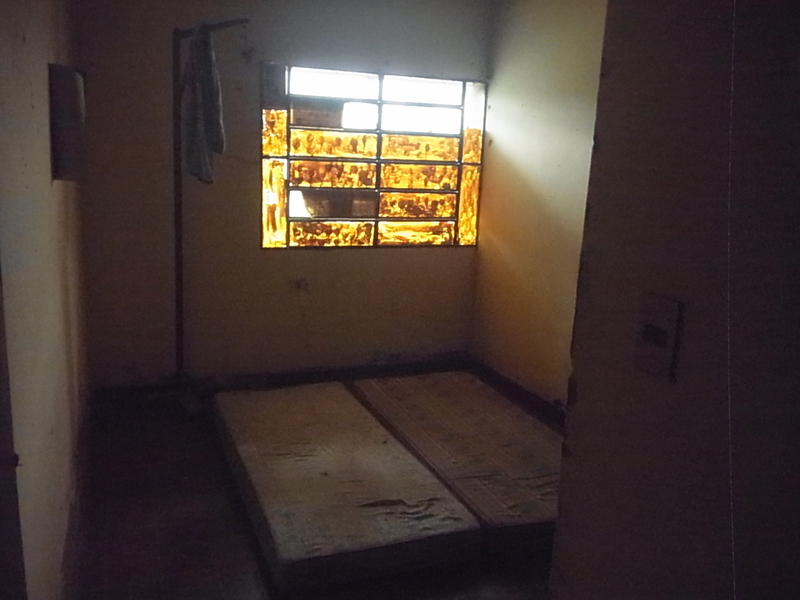 It´s divided into four rooms, one for cooking, eating and sitting together, two bedrooms and one room for all kinds of stuff. Everything is very small but functional and cozy. 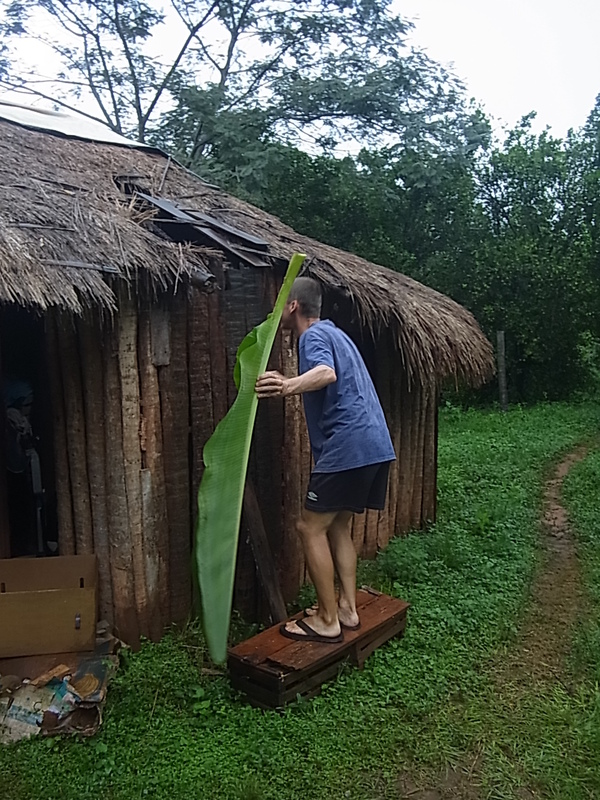 The place where we will stay for the next weeks is 200m away, it´s an old wood cabin with a grass roof and it´s built by the former owner of the property (and not built very good as Lucio tells us). 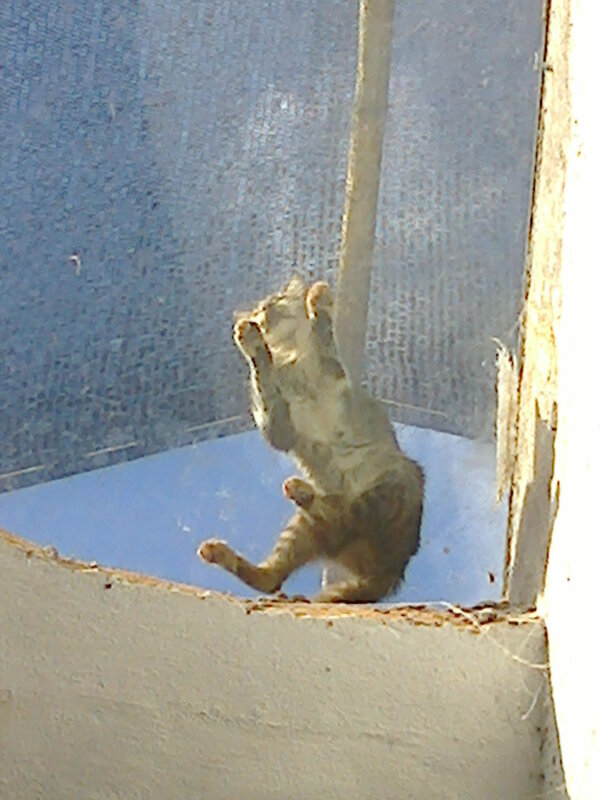 Parts of the roof are falling apart and there are large spaces between the wooden panels but since it´s unusually warm we didn´t mind. Next to our cabin grow mango and papaya trees and disparsed over the whole property are dozens of mandarin, orange, lemon, grapefruit and avocado trees, mixed within the original vegetation of palms, plants and flowers. 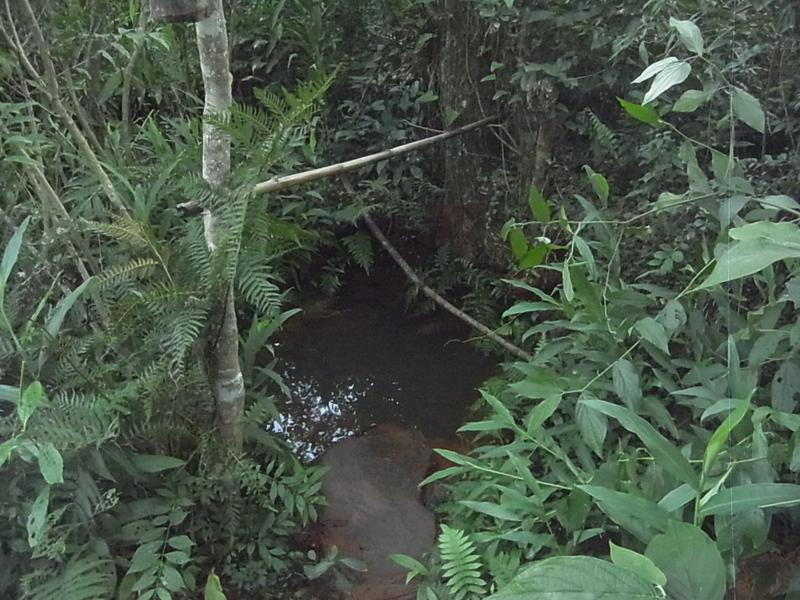 Our toilet is a deep hole in the earth and the bathroom is a natural spring where we take our showers with the help of a bucket. Usually we go for it before lunch and siesta, but sometimes again in the evening or even in the night, when temperature doesn´t drop a lot. Although it should be autumn now, days often have 30+ degrees and nights still 20. Work itself is diverse. 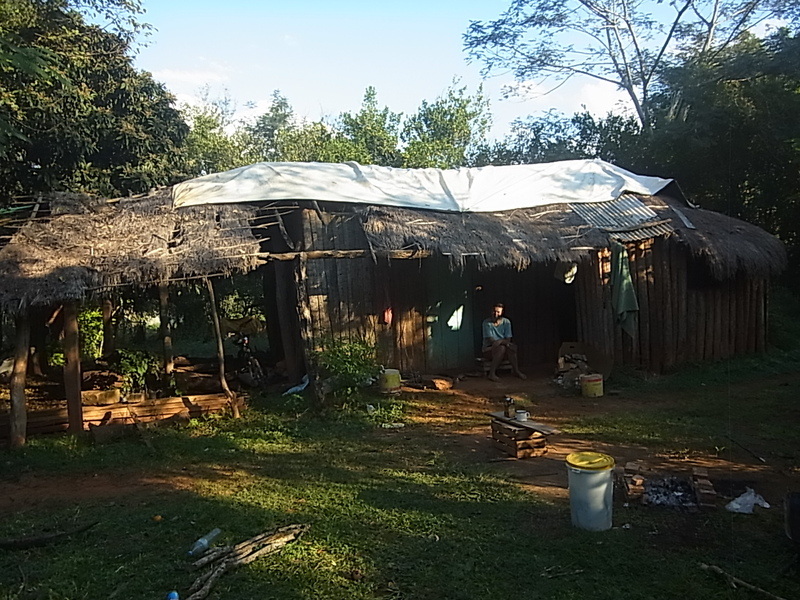 Brigitte and Lucio have been living here for two years now and they try to establish a self-sufficient way of life on the land. 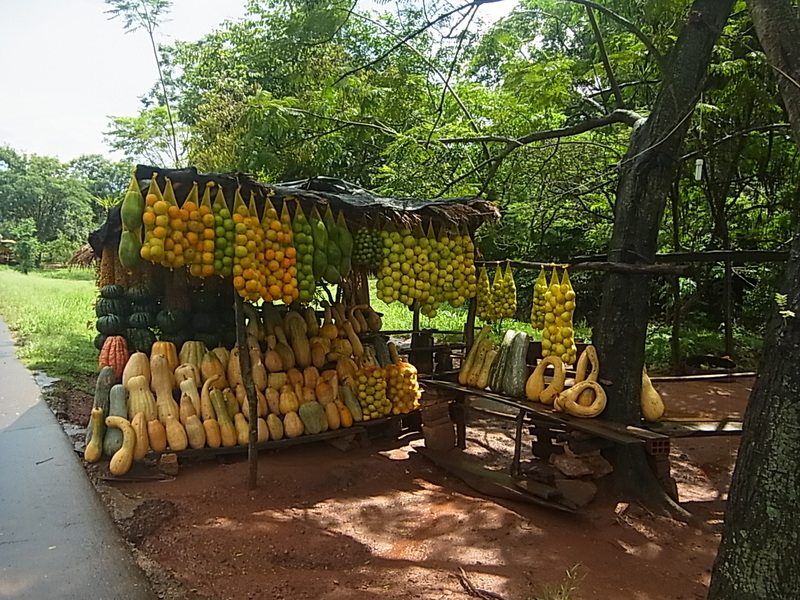 To grow what they need for themselves and a little bit for sale, but not on a large scale for profit. 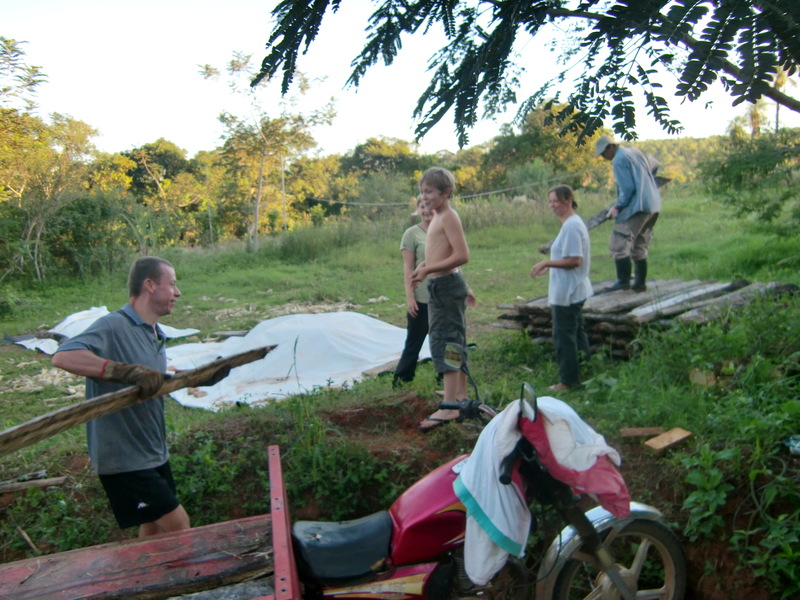 Still, to cultivate and maintain the property is a lot of work for two people and so the list of “to-do´s” is always long and helping hands are always welcome. 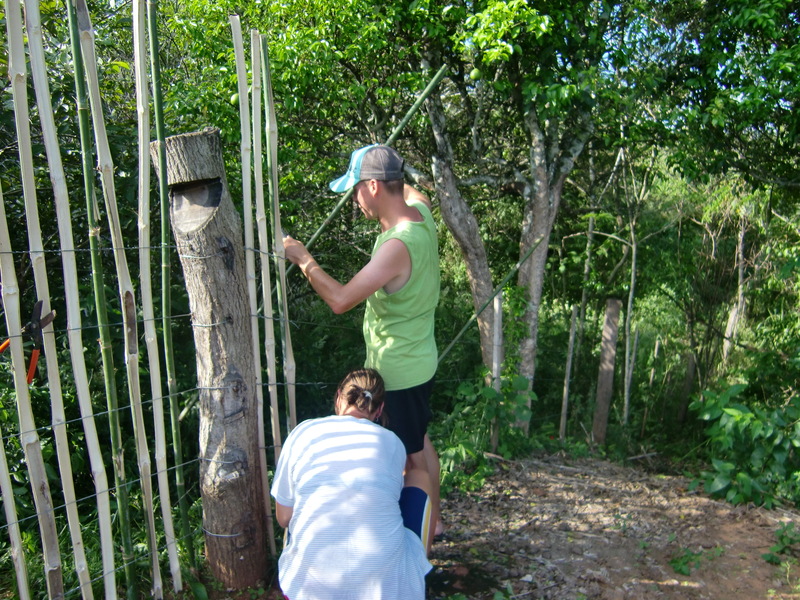 We spend the first days with building a new fence for the planned ckicken area. 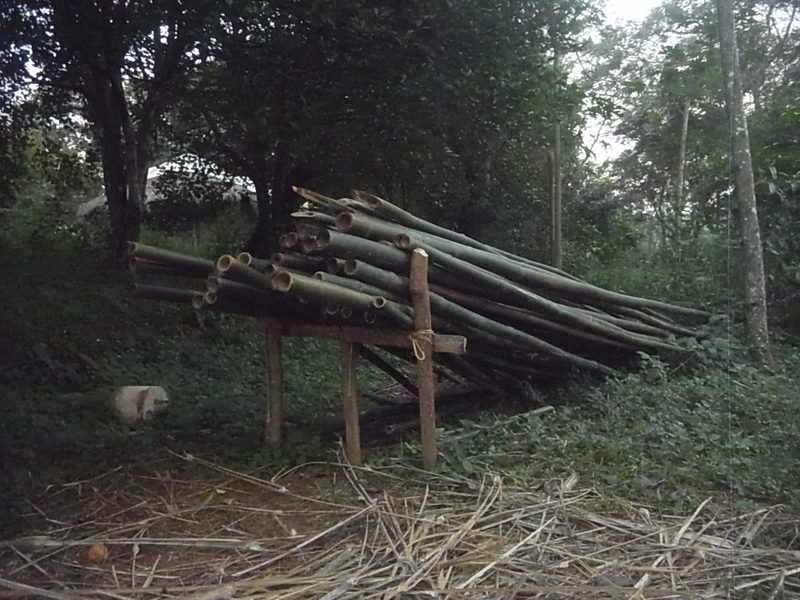 For this we have to chop down the 12 to 15m long bamboo trees with machetes, saw them to 2m pieces and split these ones in two or four parts. 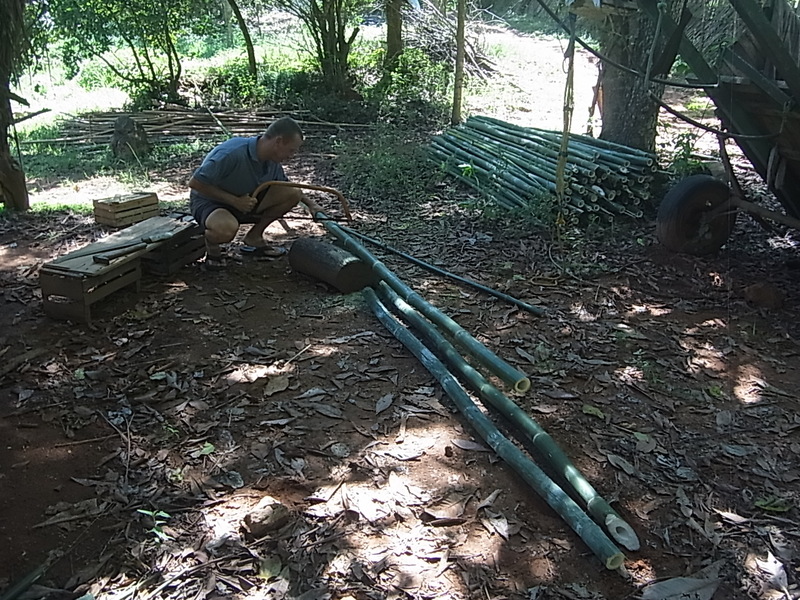 Sometimes there is a surprise, ants like the hollow chambers of bamboo and upon splitting them they will crawl out very fast and in great number, so we have to leave the place very fast as well to avoid the ants´ bites (which are not dangerous but unpleasant). 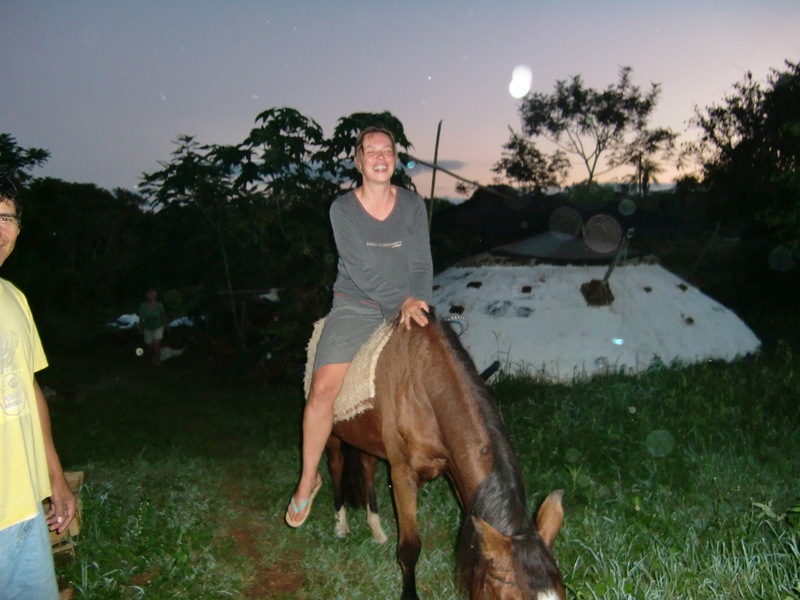 The second week Jessi arrives, a girl from the UK who worked in Chile for a NGO and is now travelling in South America. 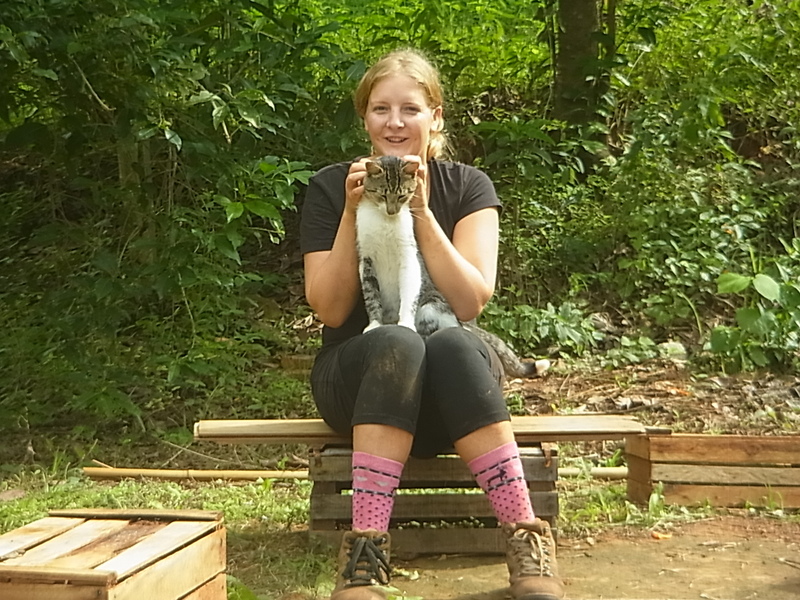 Luckily she is very sympathic and nice, so living together in our small wood cabin is no problem. Together with her comes rain for the first time here and not only a little bit, but masses of water, thunder and lightning the whole night. 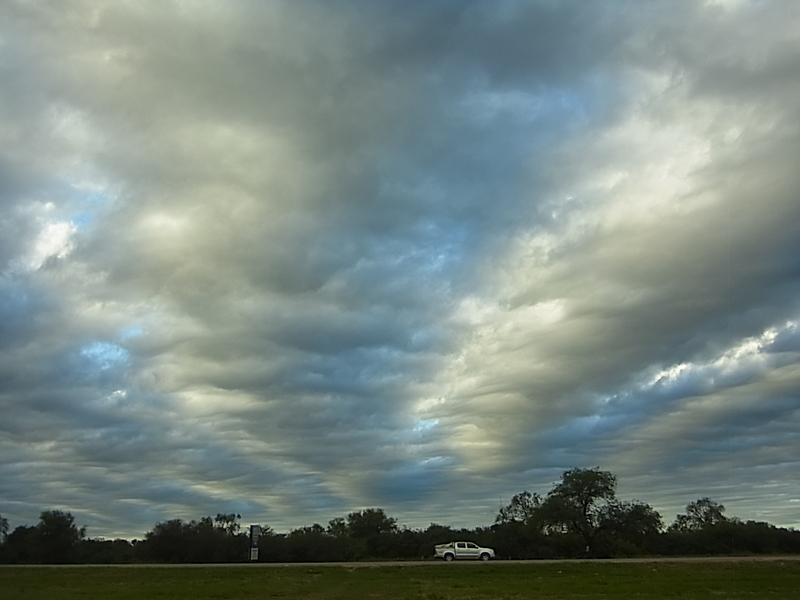 As we learn over the next time, this kind of weather usually means a cut of electricity and we have to cook over fire. And even her cold dishes are tasty and creative, like A-Ca-Ba, a mix of Avocado with Cacao and Bananas. 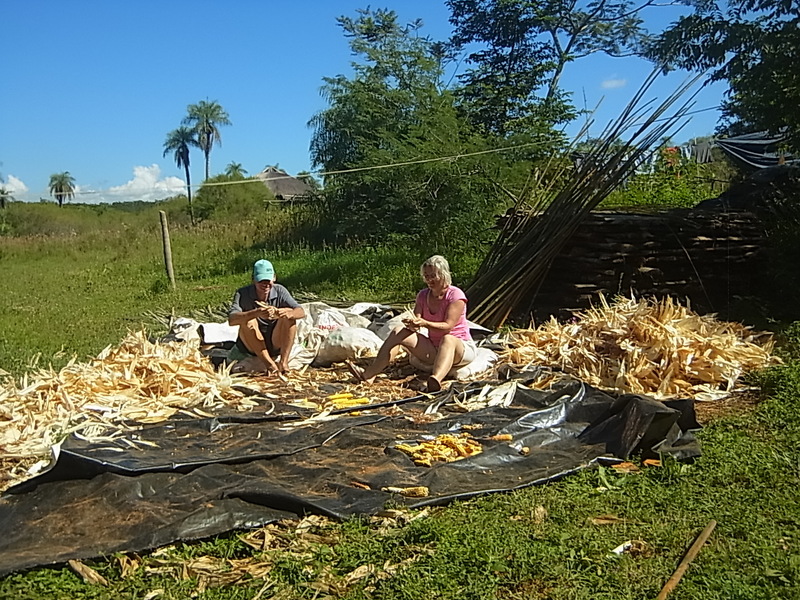 Work goes on with harvesting and processing corn and then a lot of weeding for the next seeding round of vegetables. 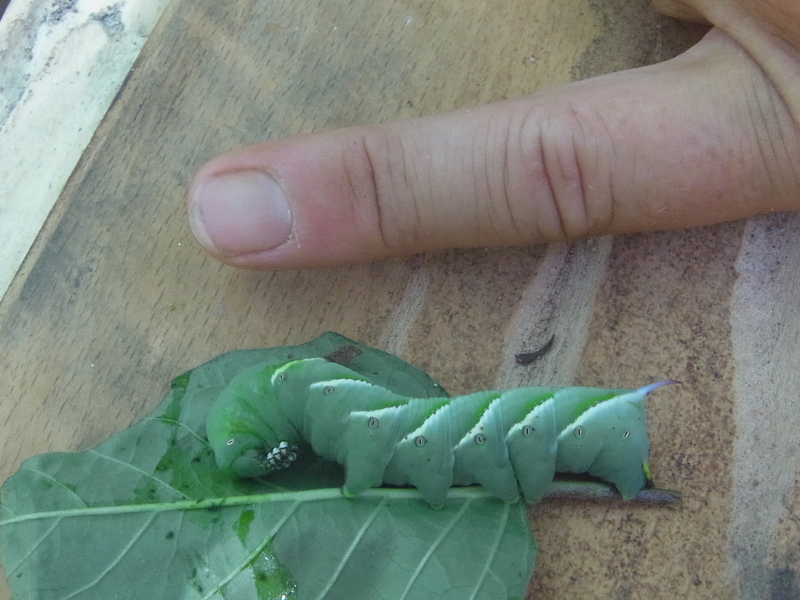 The climate is mild and allows to grow them all year round. 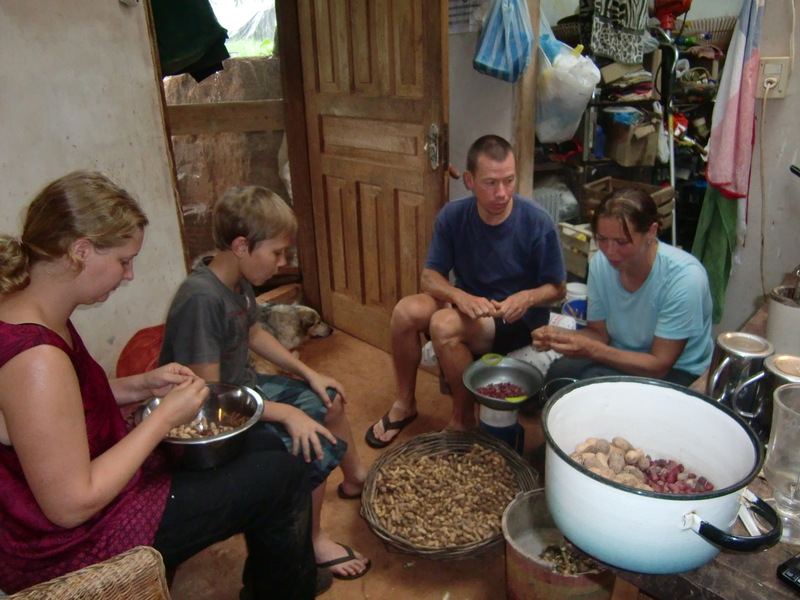 A daily task is the harvest of maniok, a root vegetable which is eaten to all dishes in Paraguay. 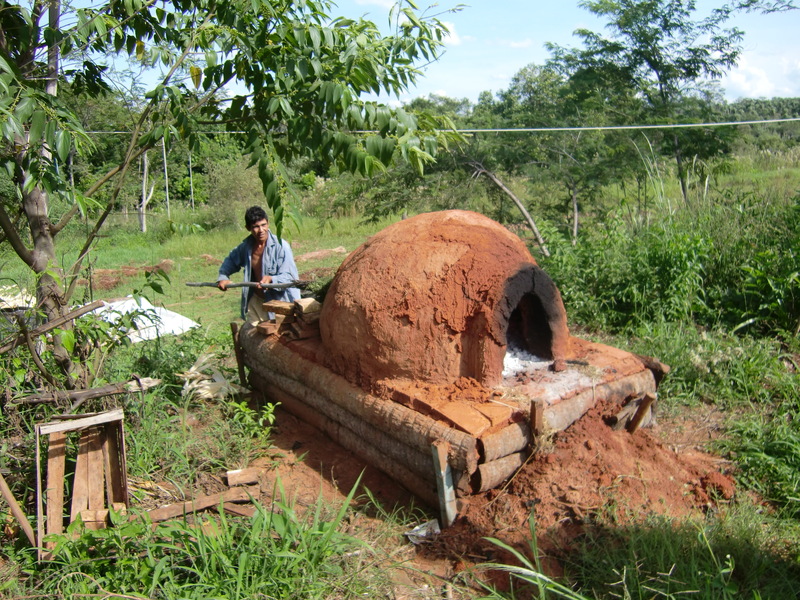 It tastes a little bit like potato but can´t be stored for more than one day once it´s digged out of the earth. And twice a day there is the obligatory pausa de terere, cold Mate. 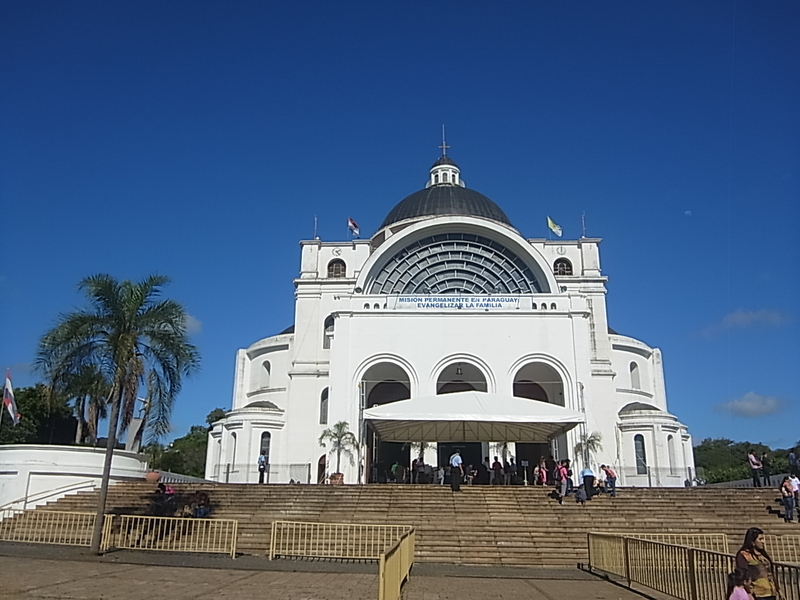 On Sunday we all go to Asuncion, a 3hrs bus-trip, to meet with Lucios daughter and his granddaughters and have a nice relaxing day in town. Then two weeks are gone and Jessi leaves again. 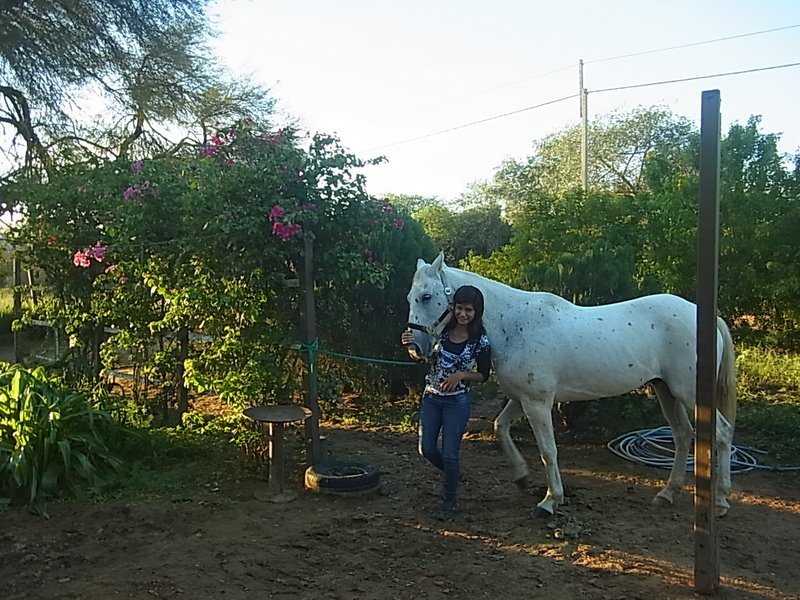 It´s unbelievable how fast time passes by when it´s filled with work and spend with people one likes! 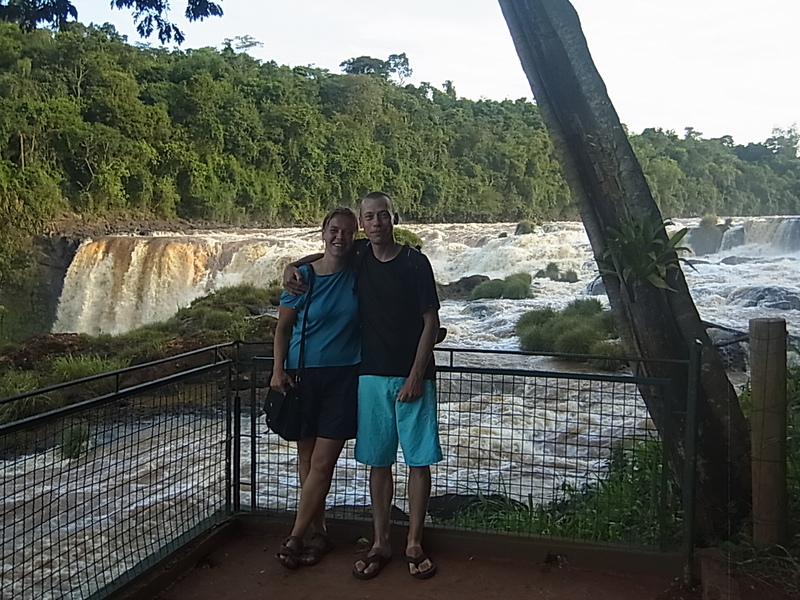 As we planned to stay for around three weeks, it would be time for us to go as well but we like the place and the family and don´t feel like leaving, so we decide to stay a little bit longer and just leave for five days to visit Asuncion (the capital which is only 70km away) a second time. 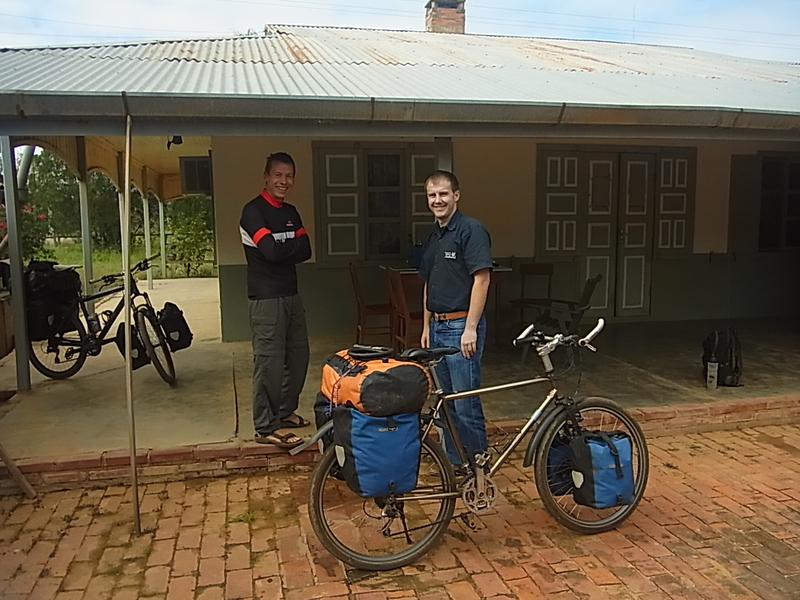 We can leave the bicycles and most of our luggage on the campo and travelling with light baggage is a nice change for us! 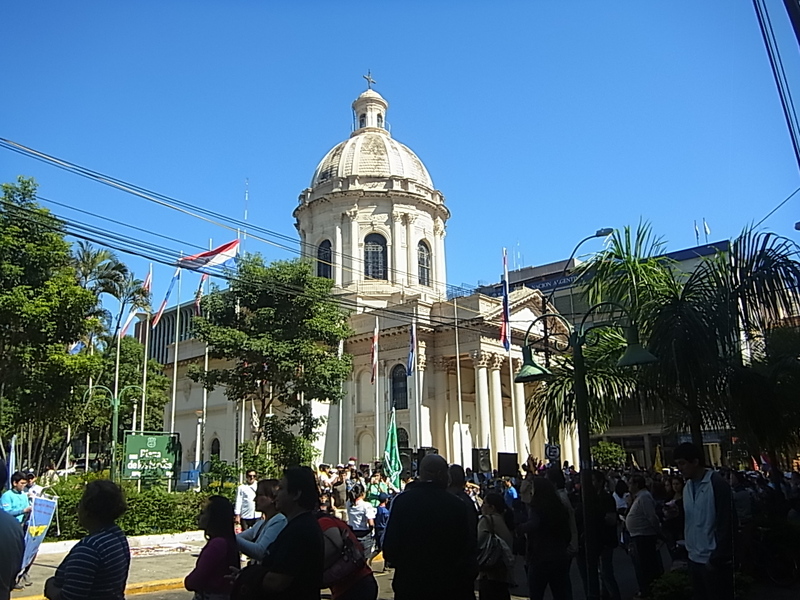 Asuncion is a rather big city, but as most of the other cities we visited not very nice on the outside. 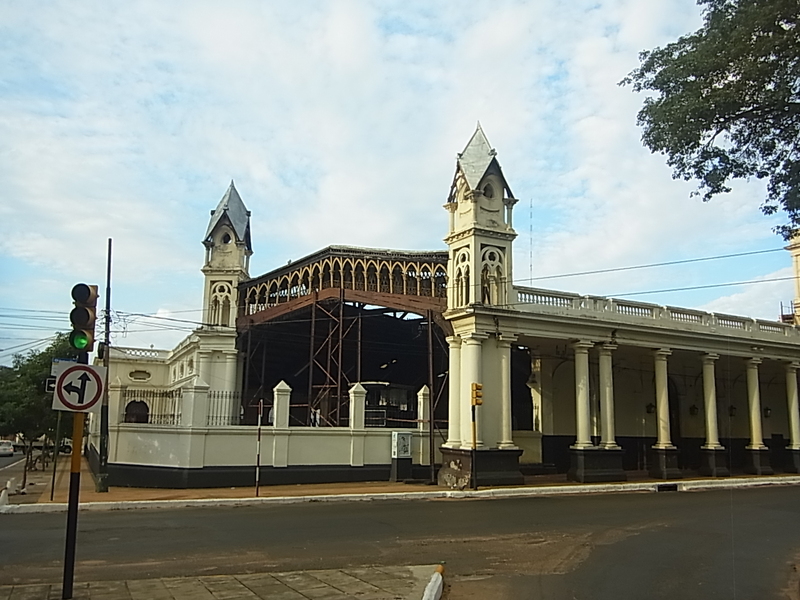 The streets and buildings look a little bit devastated, there are sparsely public places like parks where one can sit and relax a bit and walking around is quite exhausting. 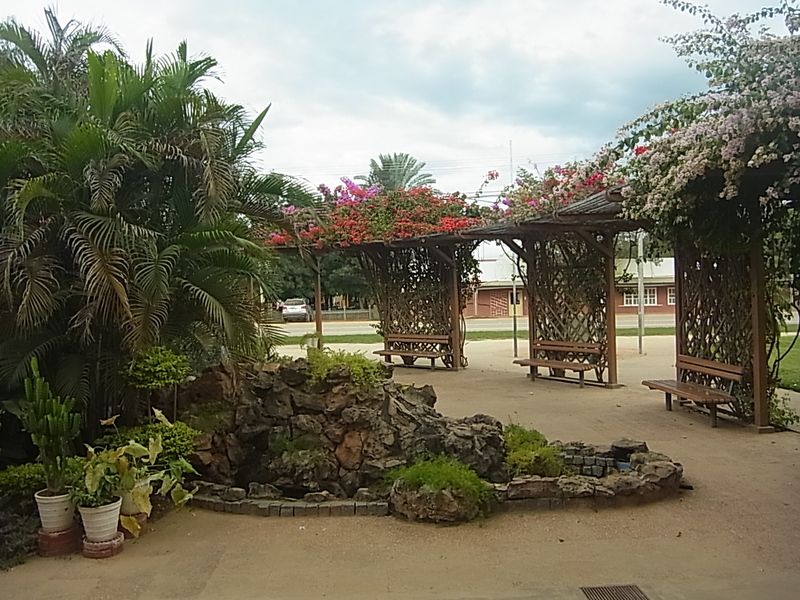 It´s quite different behind the facades: whenever we can get a glimpse behind open doors or get an invitation inside, there are big patios, lots of flowers, chairs in shadowy places and it´s always a pleasure, but only for private use. In the open the only nice and well kept buildings are the governmental ones and some statues to honour the soldiers of recent wars. But nonetheless there are also interesting places like the harbour area or “Mercado 4”, which is a seemingly endless market. Thousands of stalls with all kind of goods one can think of: food, drinks, clothes, electronics, furniture, and, and, and…one can spend hours walking around and not cross the same point two times. 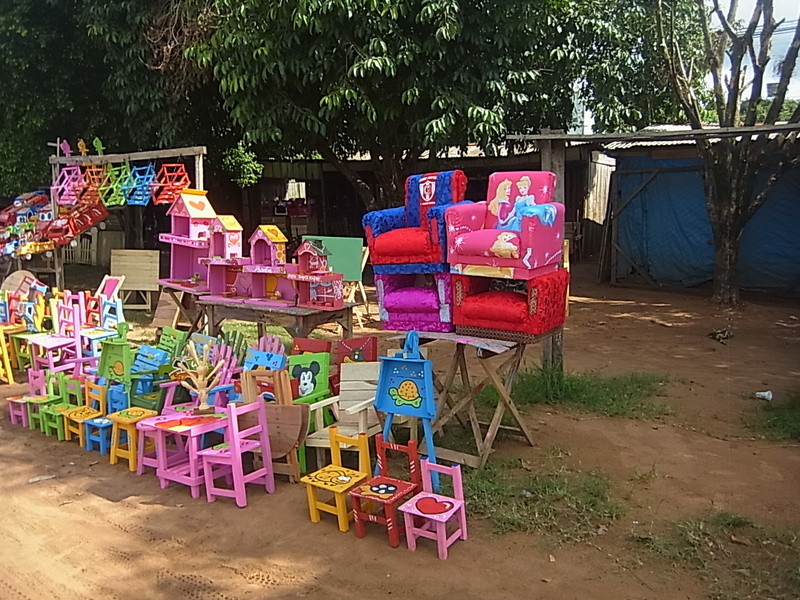 But it´s not really necessary to visit a market to buy goods. 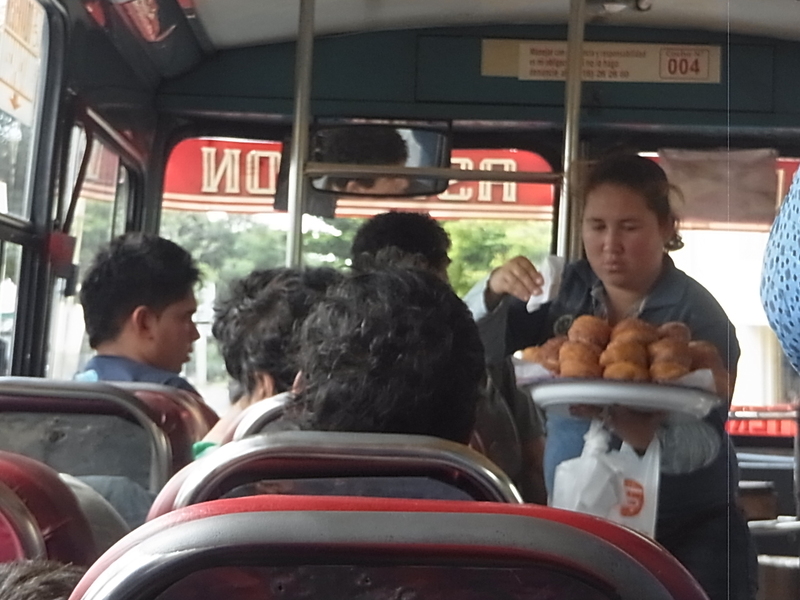 Bus driving serves the same item, on every stop salesmen hop on and off the buses and offer almost everything from chocolate bars to bibles to suitcases. Tough we don´t need any of these it´s really impossible to resist the freshmade “Bollos” with a hot drink. 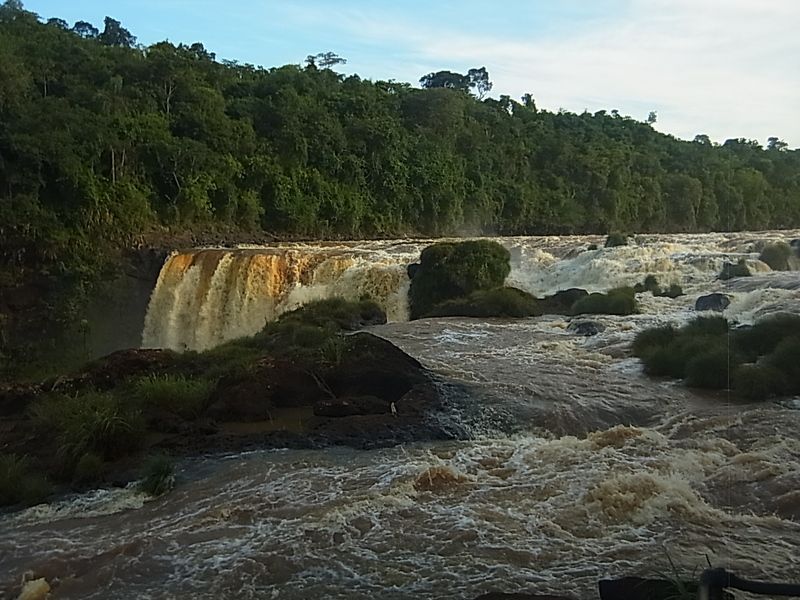 Besides exploring the city we also try to find a cargoship which will take us up the Rio Paraguay to Brasil, but this turns out to be impossible. A short time ago the Government has forbidden the transportation of passengers on merchandising boats and there are no boats for passengers yet. 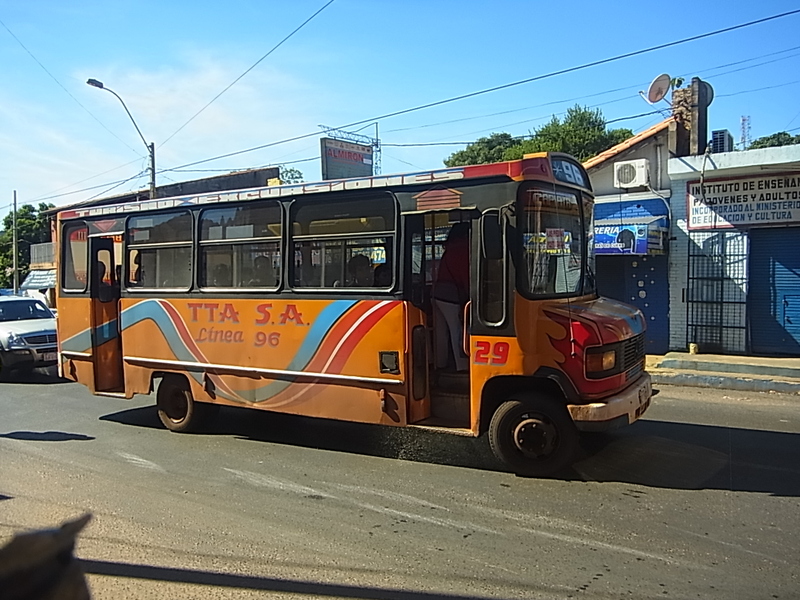 We planned to enter Bolivia from Corumba in Brasil and now we have to decide between two other options to leave Paraguay in direction of Bolivia: Bus transfer from Asuncion to Santa Cruz (uncomfortable and boring) or cycling the Chaco (800km of plain, dry and nearly unpopulated area). 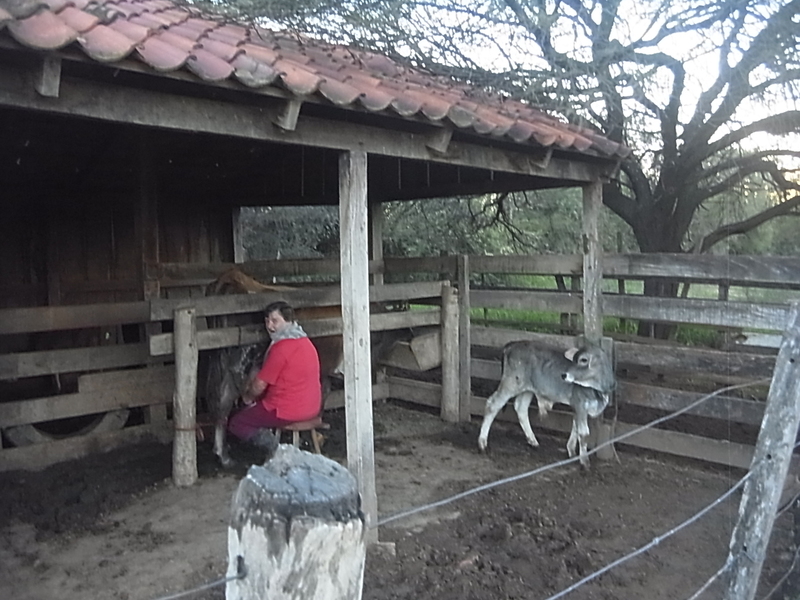 But first we head back to the campo and continue our quite rural life and work. Brigitte and Lucio plan to build a second house and this one should be totally made out of wood. 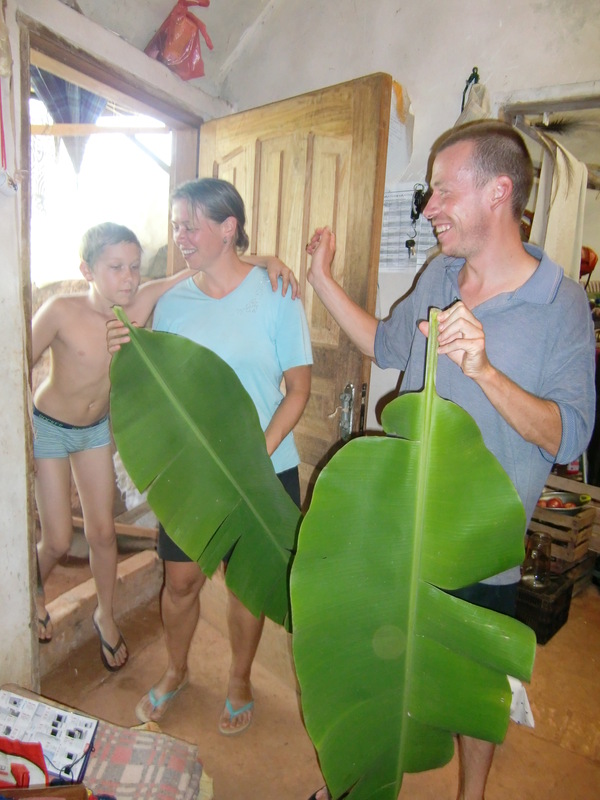 Everything they need has to be gathered first and it´s not as easy as going to the DIY and buy all the stuff, most parts have to be collected and prepared by manual labour. 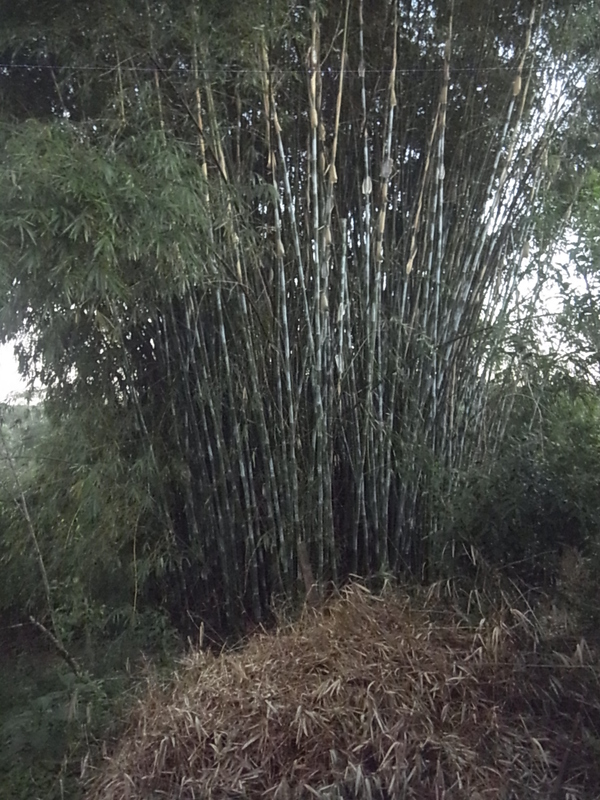 A special grass has to be collected and dried for the roof, windows have to be ordered long enough in advance to be sure they are ready six months later and again cutted and shortened bamboo is needed in large amounts to fix the roof. 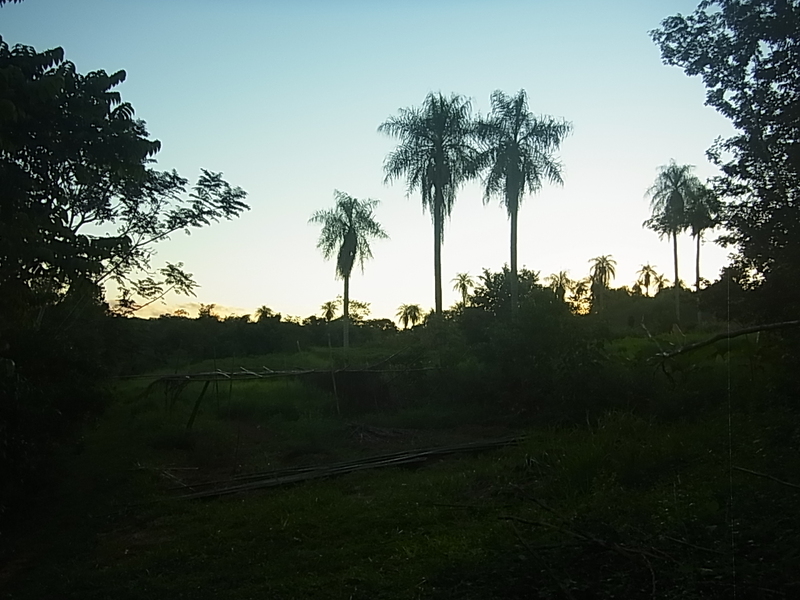 But the heaviest part is the cutting, splitting and cleaning of palmtrees like coco and karanda-u and transporting them from the place where they grow to the campo with the small motocarrito. 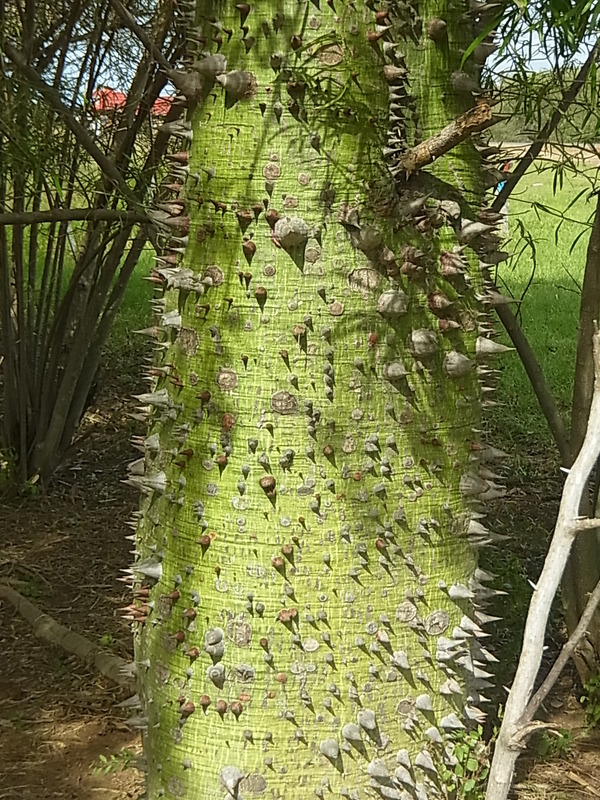 It´s hard work because all the wood is sturdy and heavy (and especially coco has long and dangerous thorns!) 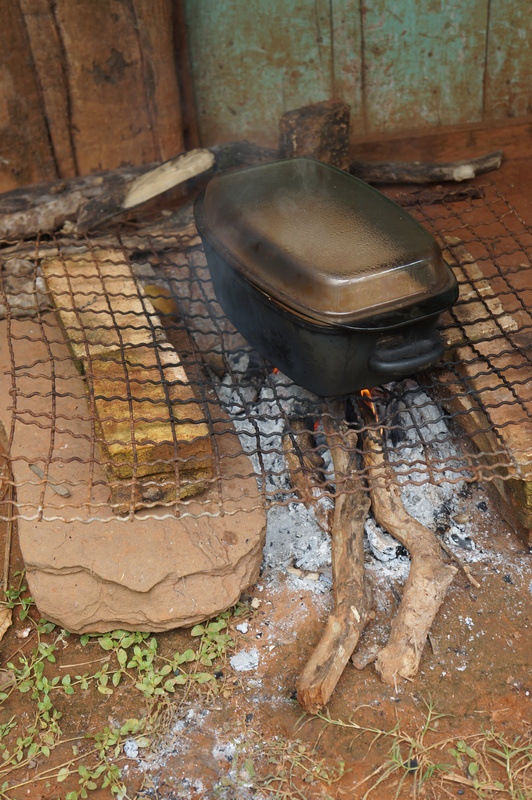 but it´s the only one that can be used since other wood would decompose too fast in this warm and humid area. It´s also in this time that we decide to cycle the whole way to Bolivia, neither of us like the thought of sitting for 20 or 30 hours (depending on road conditions and the severeness of road controls) in a bus and we are also a little bit curious, if the Chaco is really as hard to cycle through as people tell us. 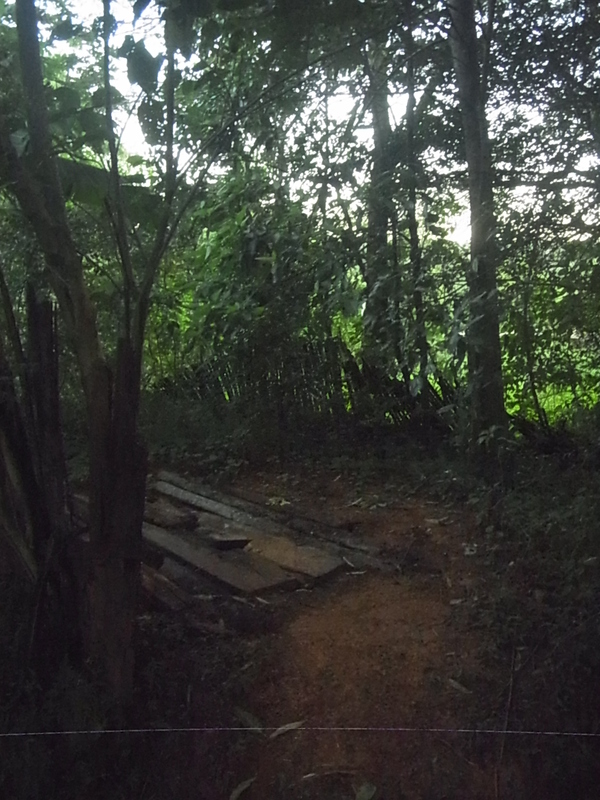 With this decision we have to think of leaving the campo at last and that´s the hardest part of the whole time there. From the beginning we have been treated like friends or family members, and it was very easy to like the family the same way. 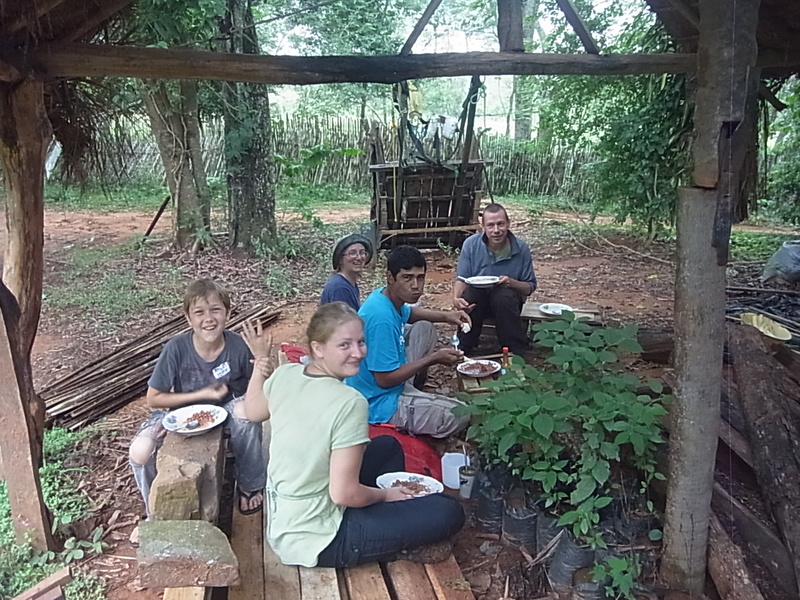 We had a lot of fun, work was never a burden, the atmoshpere always relaxed and after seven weeks we feel like being at home and not like guests. 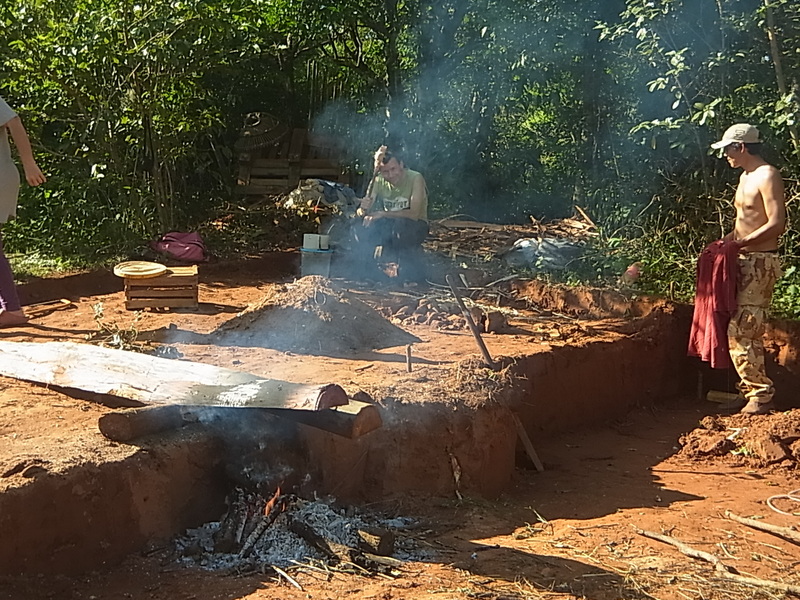 So when the day we chose for leaving comes, we let it pass again and instead continue the work for the new house which now consists of cleaning the area from plants and remove tons of earth to have a flat ground. 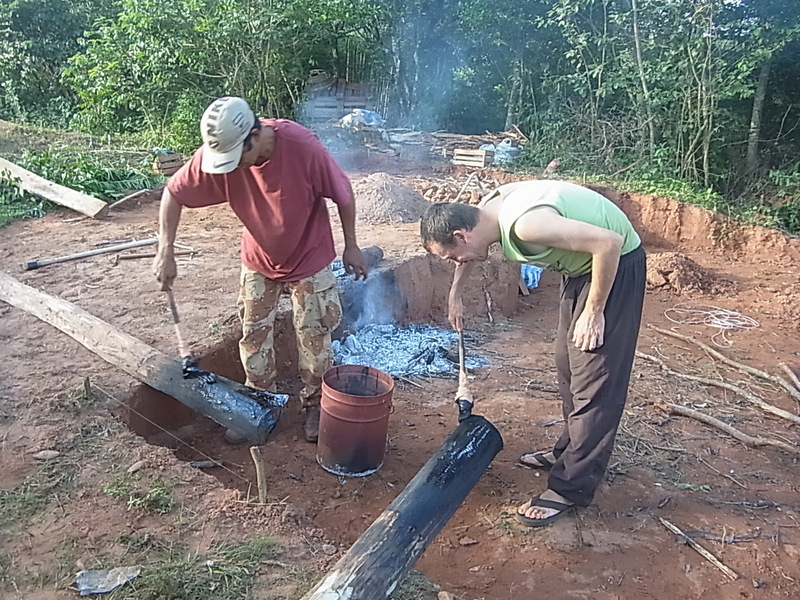 Then the first wooden logs for the posts must be peeled and impregnated with a mix of melted asfalt and kerosene. One week more passes by and we still don´t know if we want to stay the whole winter time or move on now. Than the decision is taken out of our hands, another couple asks for staying at the campo and we take this as the signal for leaving. 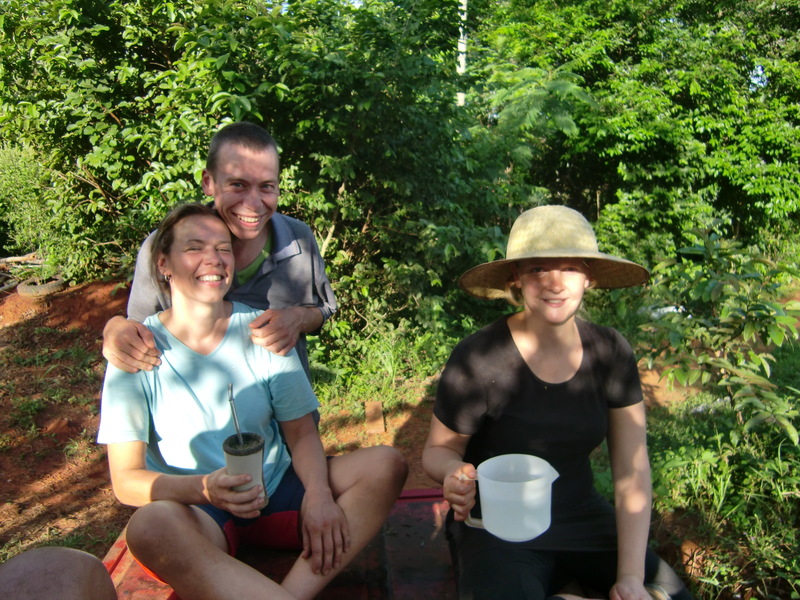 Four people is too much for the place and there are not many other workaway-places in Paraguay, so we have the feeling it´s best to move on. 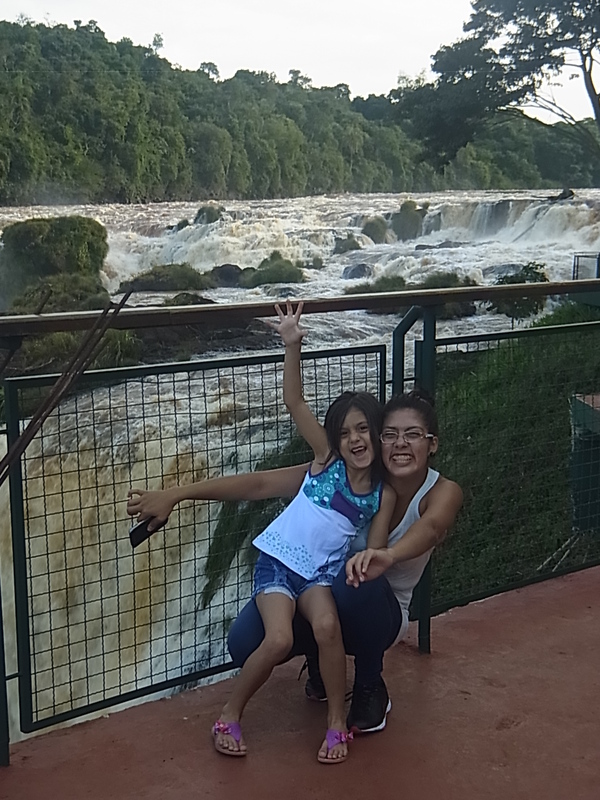 With Iguazu as the highlight of our time in Argentina we leave the country for the last time and get our sixth exit stamp at the border. 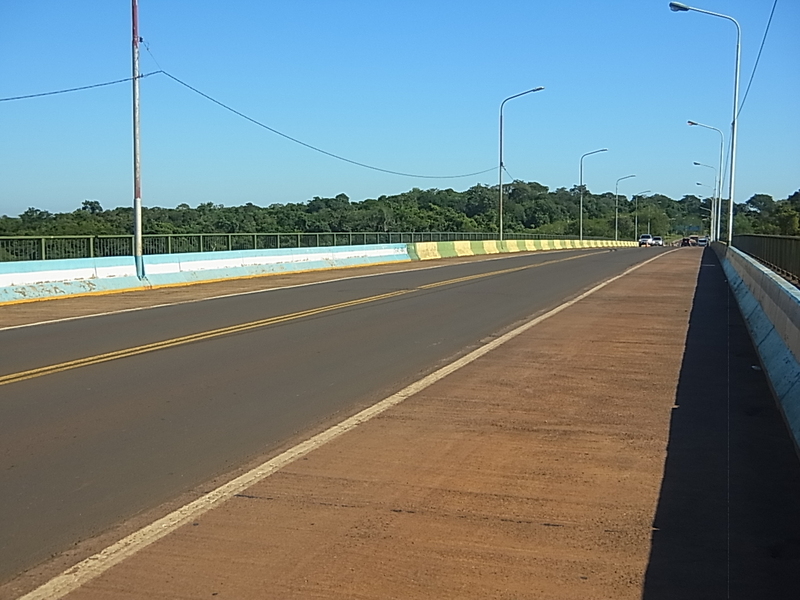 We cross the bridge to Foz de Iguacu in Brasil and it´s easy to see where one country ends and the other starts. 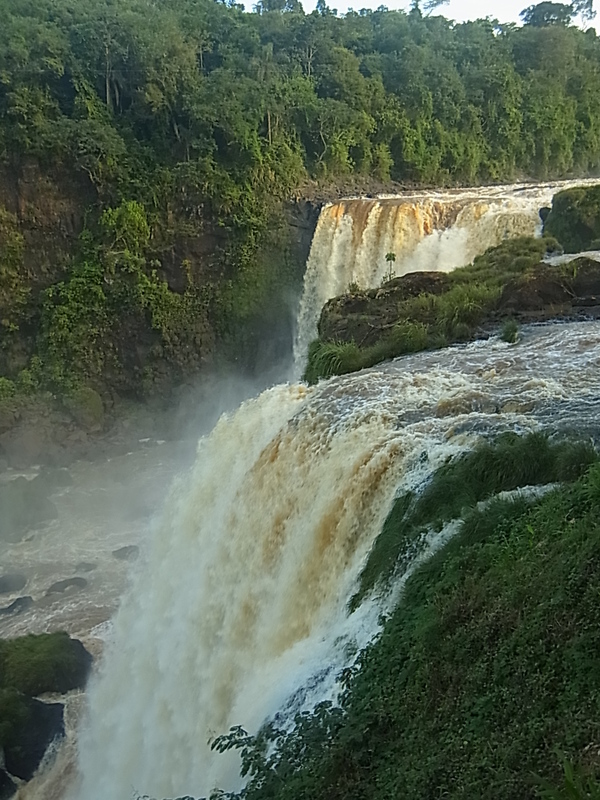 Foz de Iguacu is a rather big city, it takes us nearly an hour to cross it and since it doesn´t look very nice we just stop at a Lancheria to spend our last Reales on food and then go on to the paraguayan border. 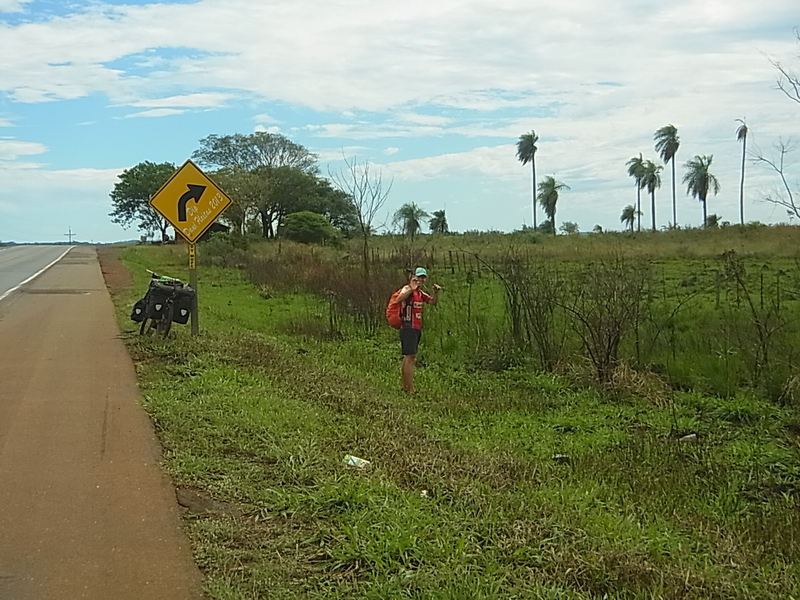 Signs are not necessary to find the way, we just have to follow the main road and the thousands of cars which head in the same direction, cross a second bridge and then we enter Paraguay. 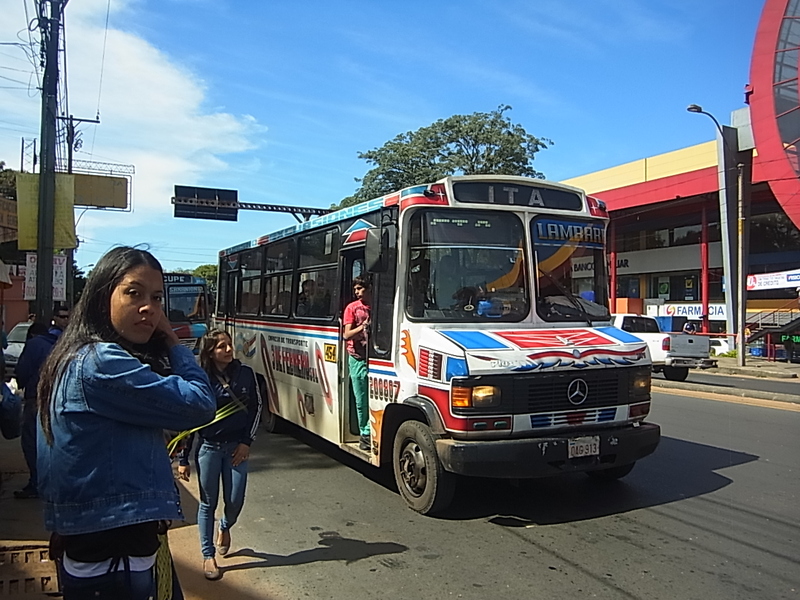 For the first time in South America we see such a traffic mayhem, a real chaos of cars, motorcycles, buses, trucks going from right to left and crossing one another. We are the only ones going into the migration office, apparently for the locals no visum is needed to cross borders. 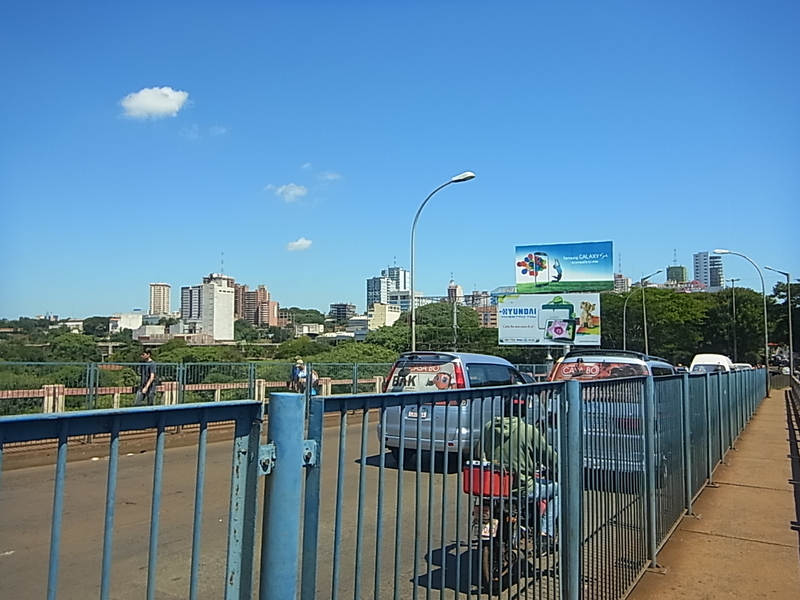 The other side in Ciudad del Este is even worse what concerns traffic, a miracle no accidents happen here, but for us on our bicycles it´s a little bit scary. Besides the traffic there are long rows of marketsellers, people who offer money exchange, thousands of yellow Moto-taxis, all kinds of foodsellers and of course masses of people. 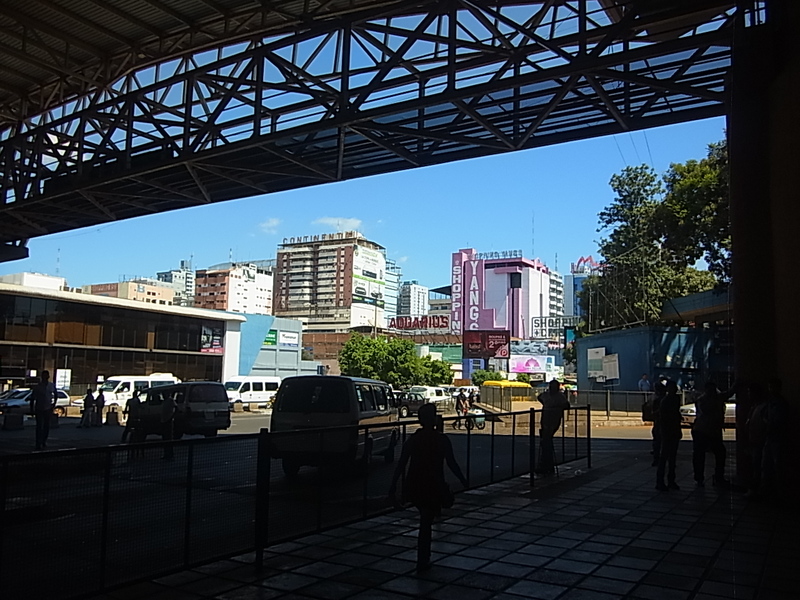 Originally we were thinking about looking for a new camera, Ciudad del Este is well known for cheap electronics, but the mix of traffic, people and noise is overwhelming and we decide just to pass through town and leave after a short stop at an ATM. 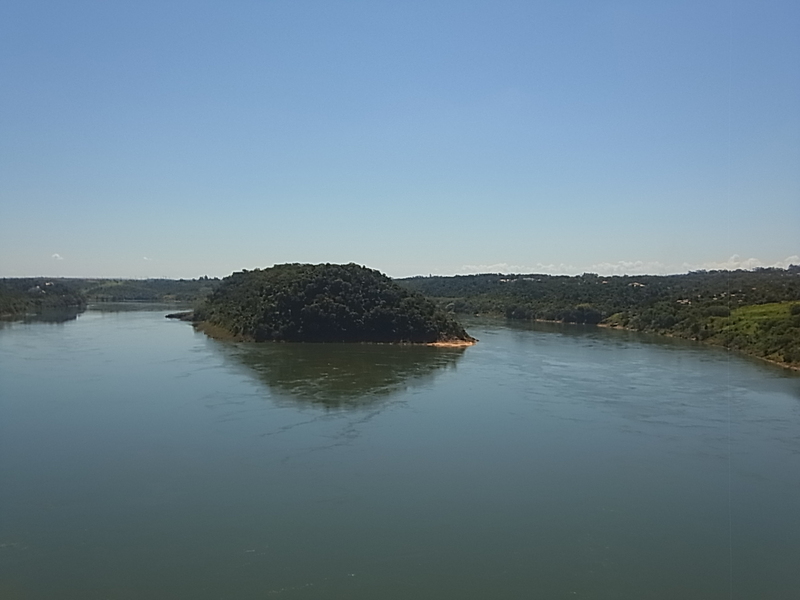 Our destination for the day is Hernanderias, a small village near the Itaipu embalse and the Nationalpark which surrounds it. 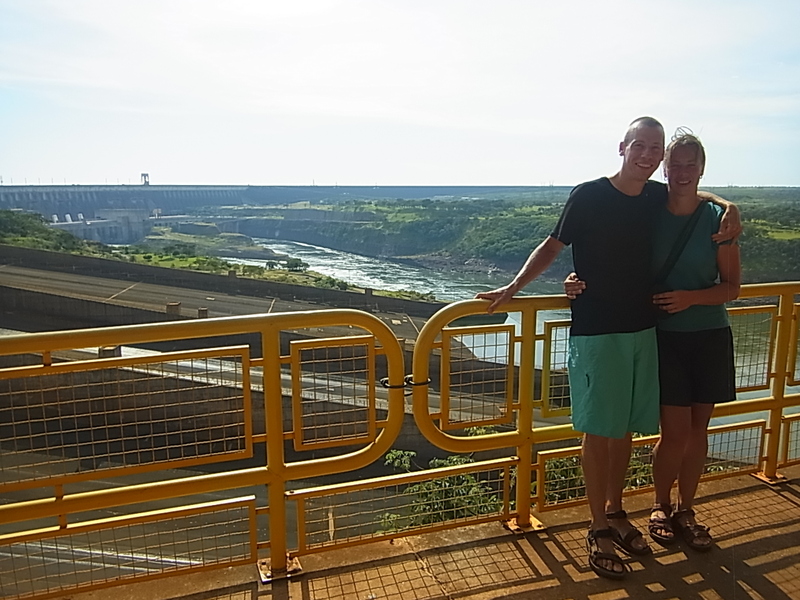 When arrived at Hernandarias, we are called by a man from the Itaipu Power Plant. 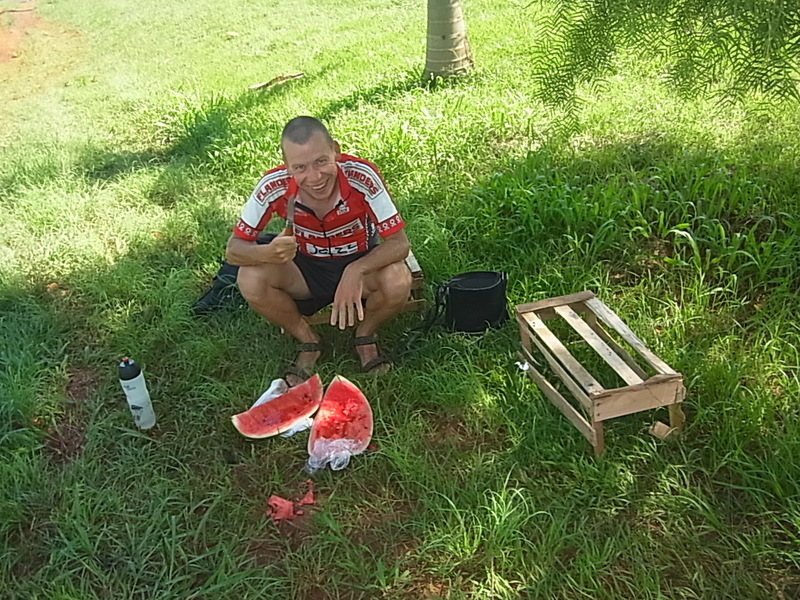 Manolo tells us that it´s not possible to camp in the Nationalpark because there are local strikes with roadblocks and instead invites us to stay at his house in Ciudad del Este. 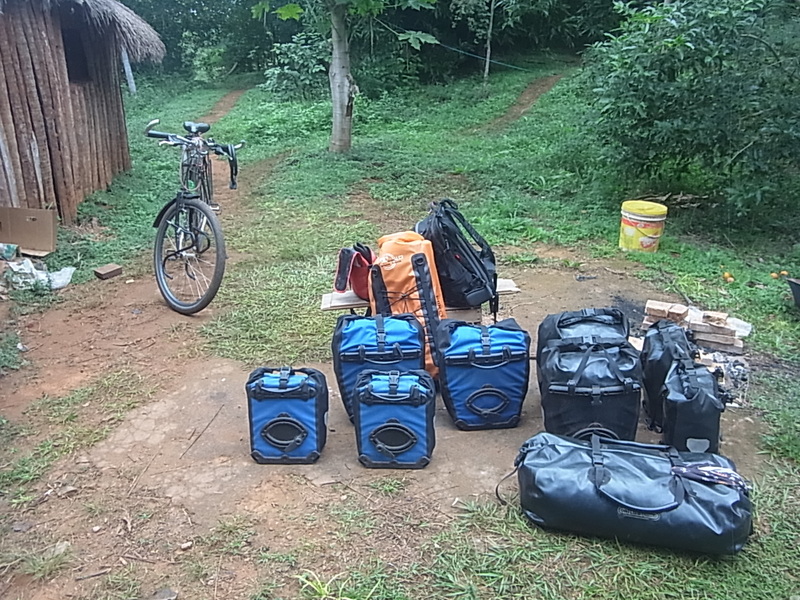 So once again, we load our stuff and ourselfes on the back of a Pick-up and drive the whole way back to town: 3hrs ride by bicycles – 20min by car. 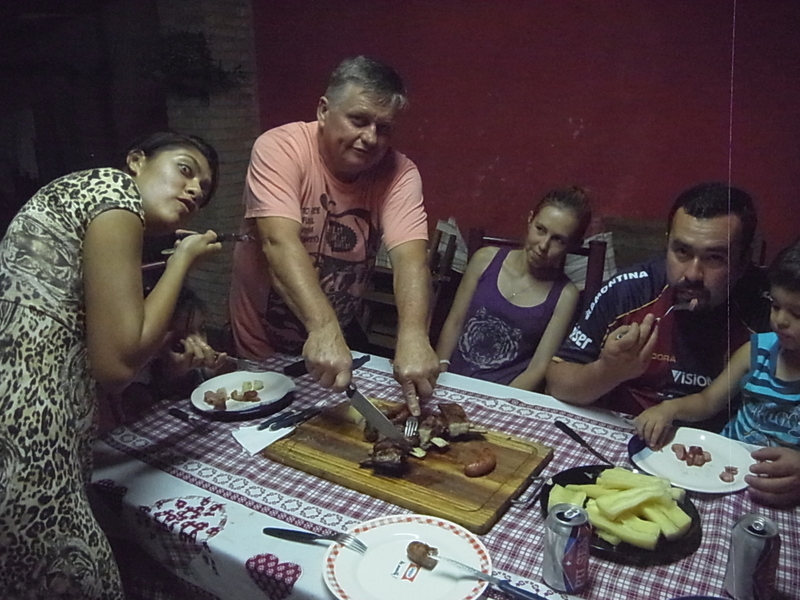 We stay for three days with Manolo and his family. 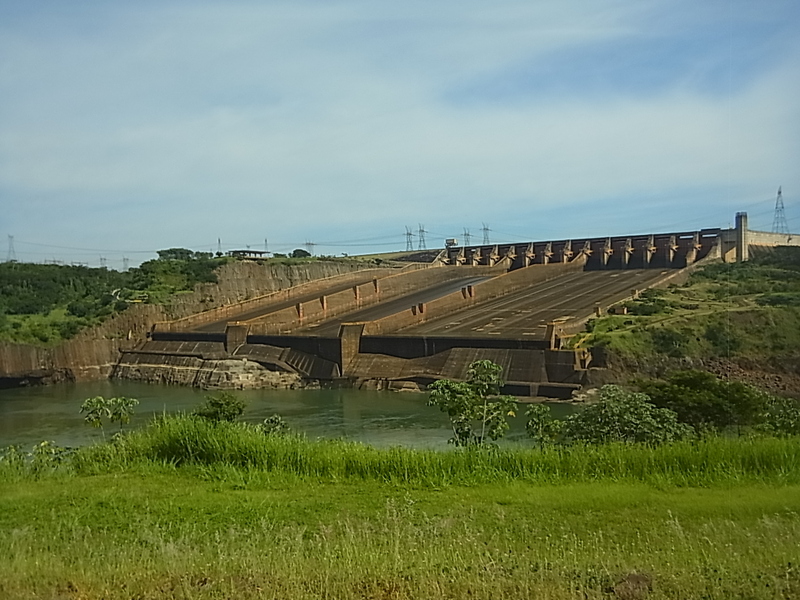 The first day we visit the “Itaipu Binacional” Hydrogen Powerplant which created the embalse and it´s really big and impressive. 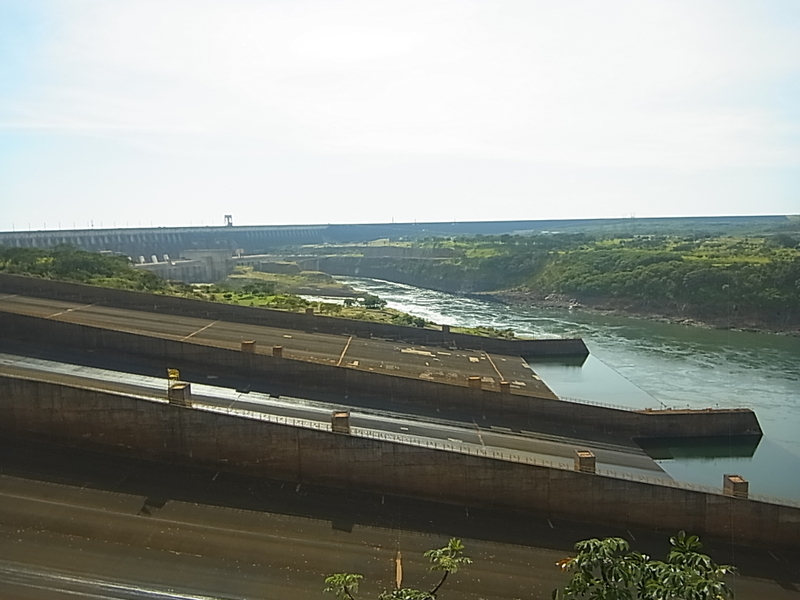 It´s a collaboration project of Paraguay and Brasil and in 2008 the company set the world record for one year power generation, the annual production was equal to two days of world consumption of electricity. 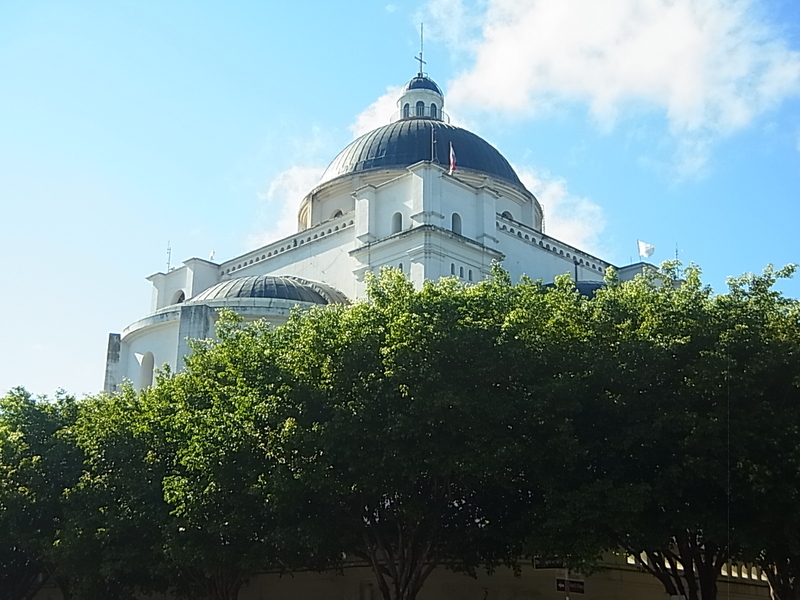 Our first full day ride in Paraguay starts off with a 10km trip through the busy streets of Ciudad del Este, and than onto the Ruta 2 – la supercarretera – leading to the capital Asuncion. 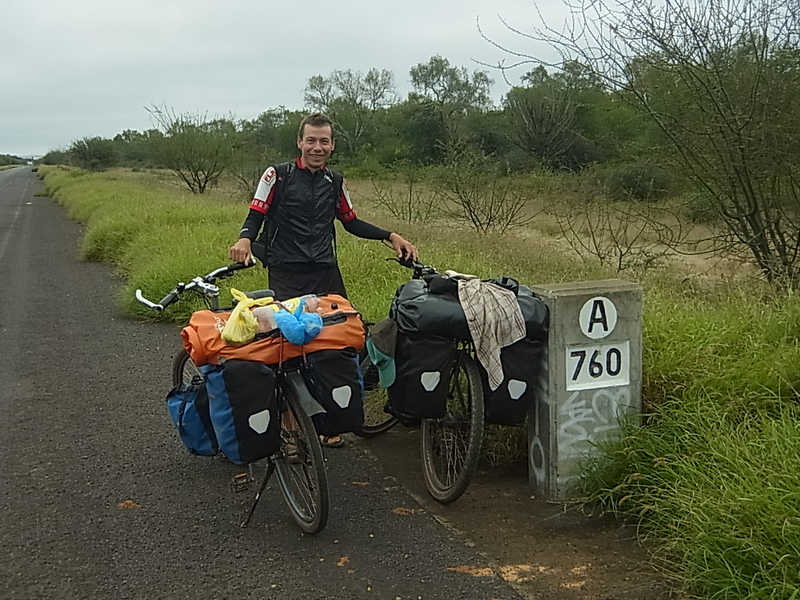 Following it we cross the country from East to West and it´s quite different to cycle here then in Argentina. 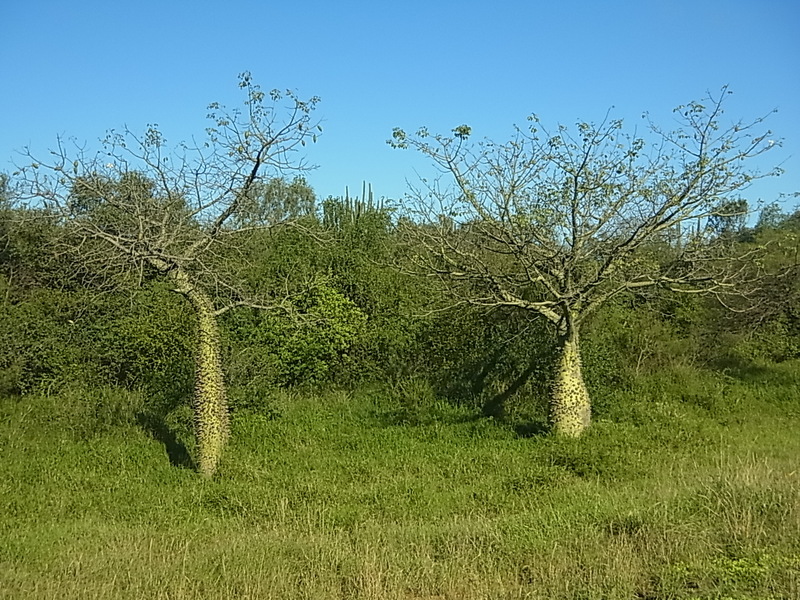 Paraguay is dominated by agriculture and keeping of lifestock, so one difference is the change of nature along the way. 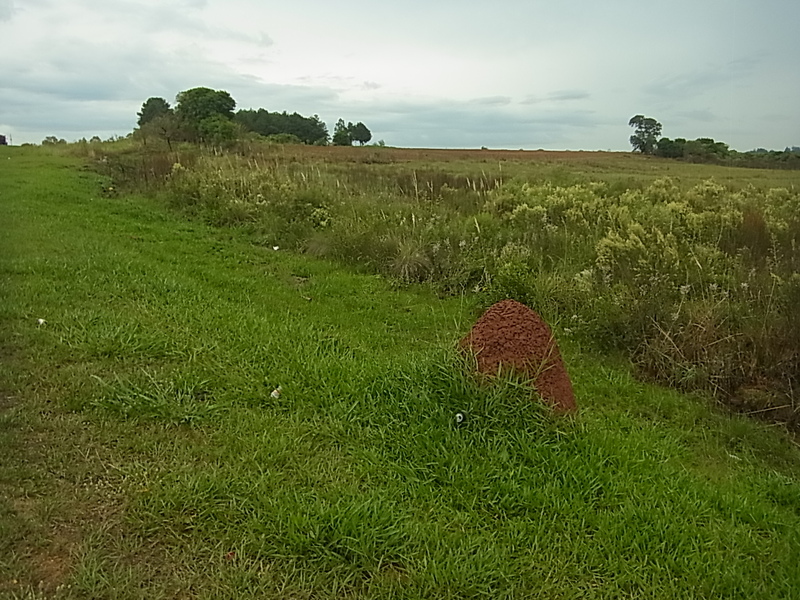 The dense, overgrown vegetation of Misiones switches to more or less plain pastures and big fields. 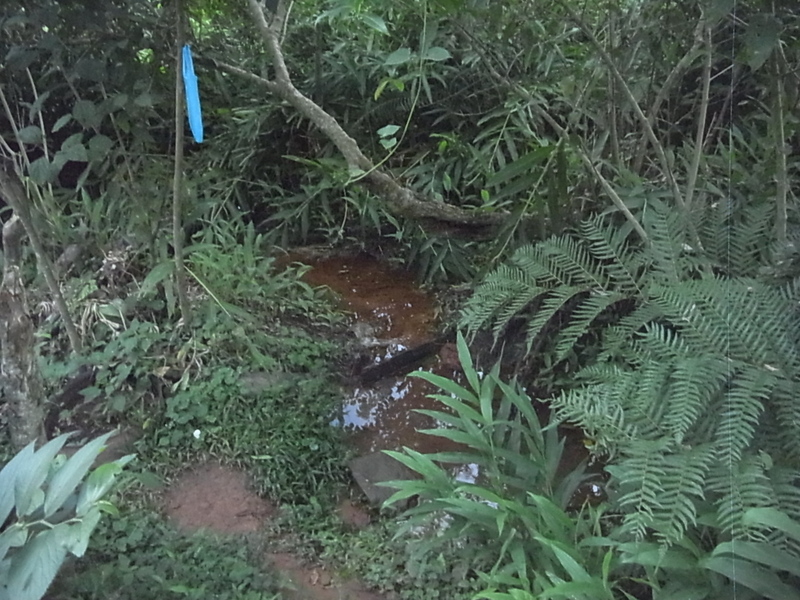 The colors fade away, instead of dark, rich green we are surrounded by all shades of light green and brown. 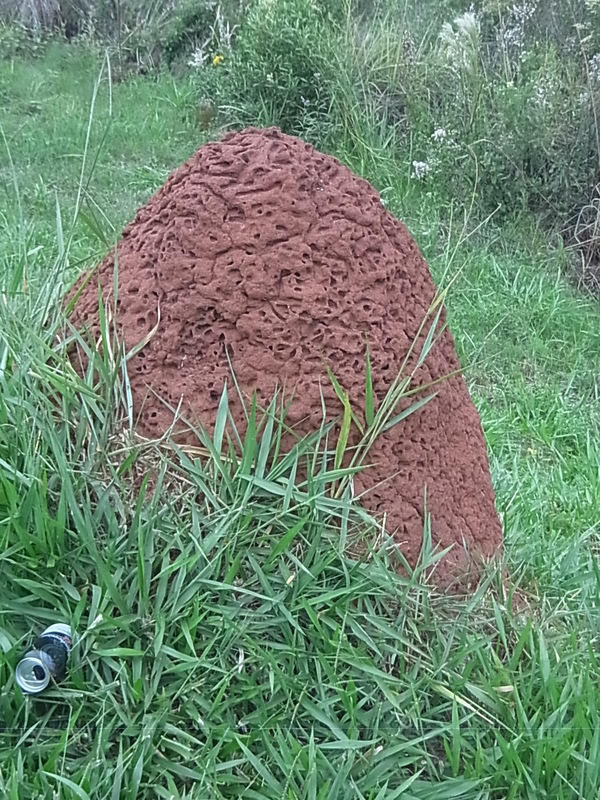 A common view are also the very big termite hills which add a little bit of red to the color scale. Cultivated land means also more population, there are a lot of little settlements one after another along the Ruta 2 and sometimes it´s hard to say where one village ends and the other starts. 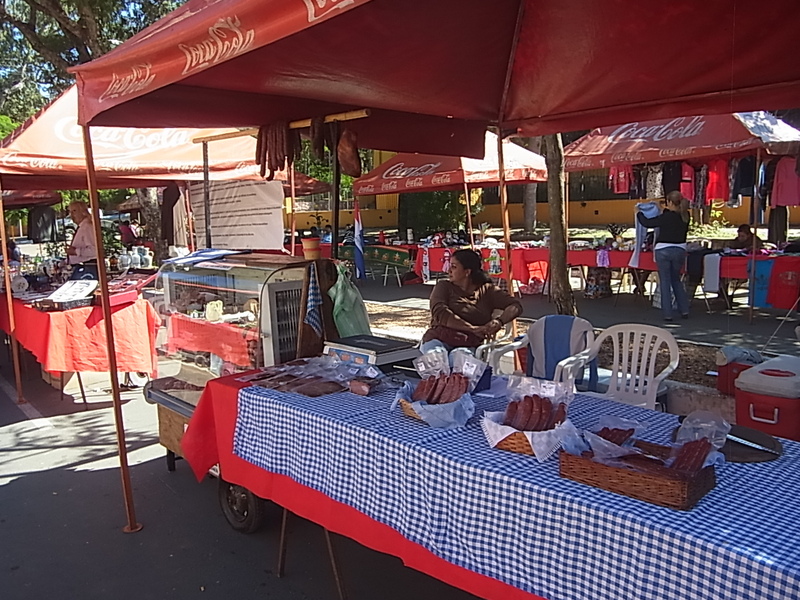 Cooking is not necessary, there are also lots of streetsellers with small barbecues, selling meat-on-a-stick, sausages and ribs, all from beef and always accompanied by cooked Maniok (similar to potato and the most eaten vegetable in Paraguay). 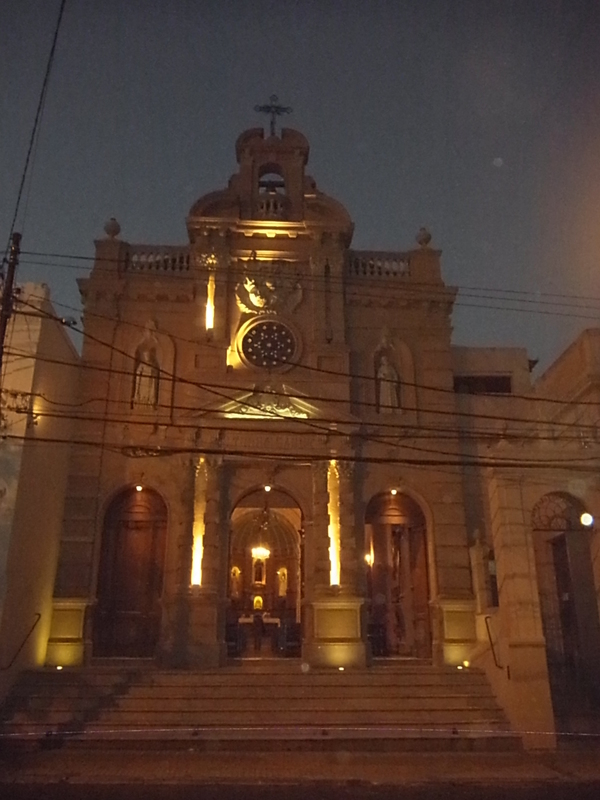 What was “Gauchito Gil” in Argentina, the Saint of safe travelling, is here “San Expedito”. 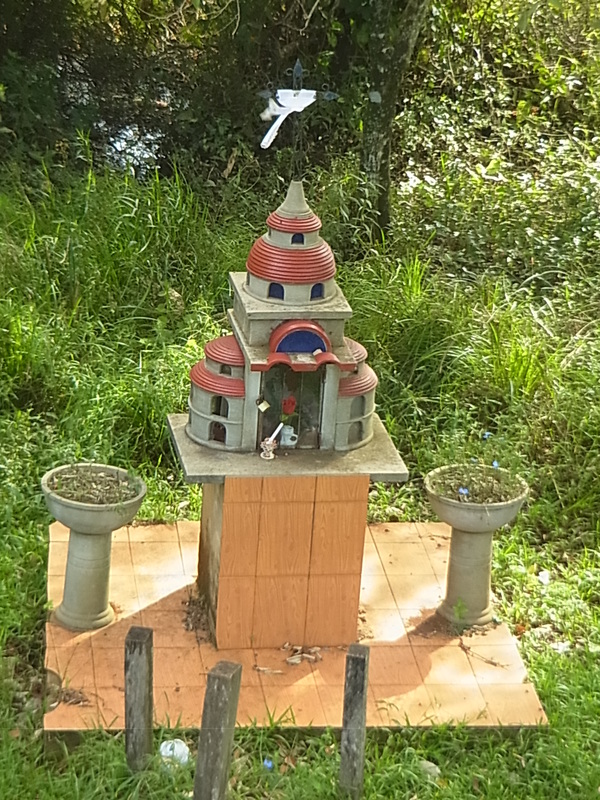 But instead of offerings of food and water people build impressive sanctuaries. The following two days it´s easier. Rain starts around four in the afternoon, both times we get soaking wet and cold within a few minutes and are glad to find some hospedaje or hostel to have a dry and warm room for the night. 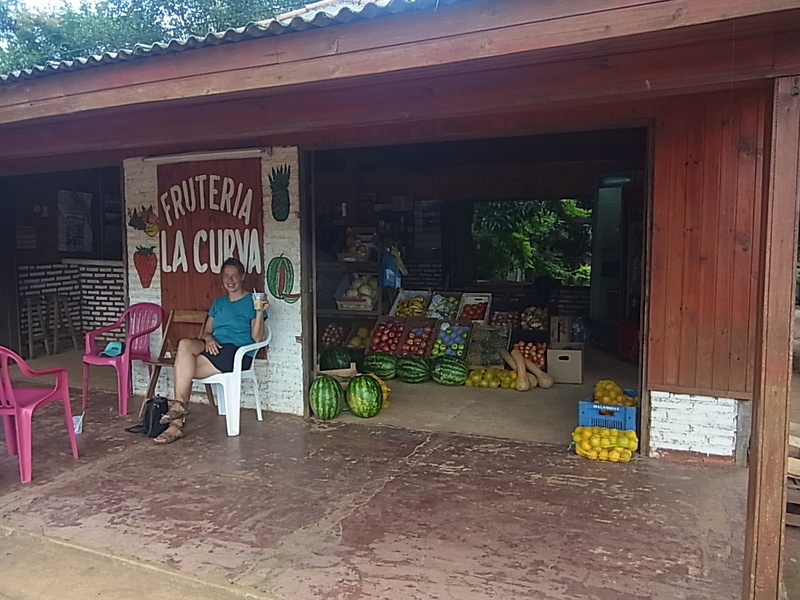 On the fourth day around noon we arrive in Itacurubi de la Cordillera where we take lunch in a road restaurant and then start cycling the last 15km to Eusebio Ayala, where we are going to have our first “workaway”-stop in South America. We reach km-mark 76 around 3.00PM, where we should take the dirt-road right to get to our accomodation for the next few weeks. 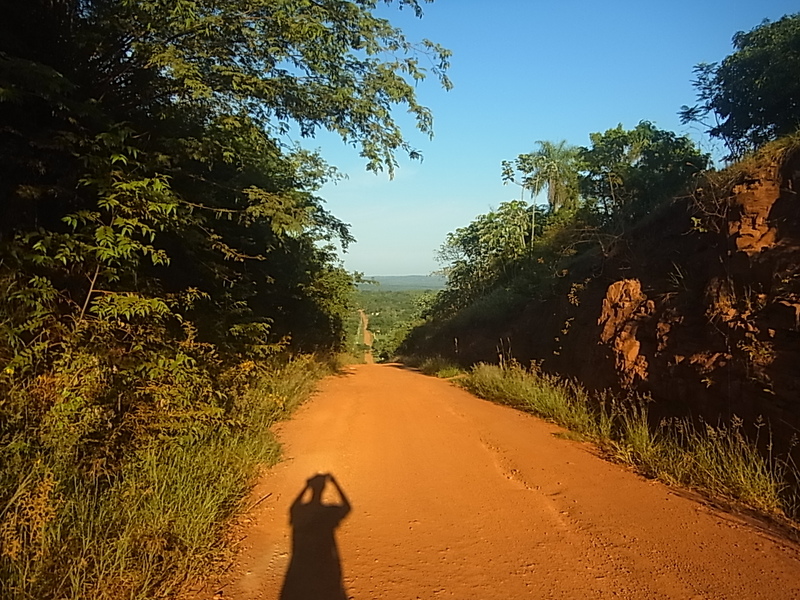 The road leads up to a very steep hill and it is very hot on top of that but we master the climb and cycle on for about 4km, as the directions said. But instead of the farm of Brigitte and her family we just find an unfriendly woman who behaves like we are going to rob her or something similar and who says she doesnˋt know anything about another german woman. Unlikely in a small area like this one, where everybody knows everybody and every european person sticks out immediately. 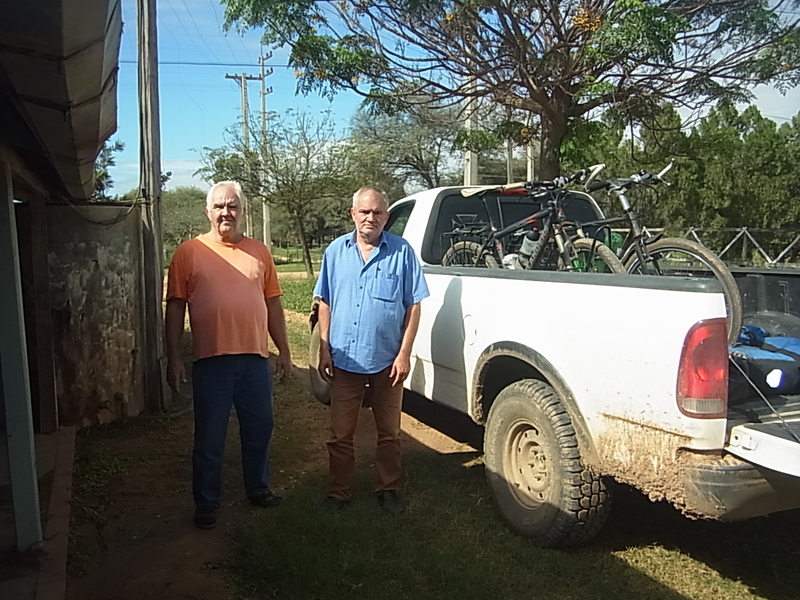 However, we go back to the small despensa and are more lucky there, just as we speak to the owner a motocarrito ( motorcycle with attached trailer) with two persons arrives and they turn out to be Lucio and Patricio, man and son of Brigitte. So we have found the family and they lead us to their farm, which we would never have found on our own, since we have to take some very little paths to get there.Once arrived, we are greeted in the nicest way by Brigitte as well and can move in our new “home”, where we plan to stay for around three weeks and exchange work power with food and accommodation. Opnieuw prachtige beelden en 2 gelukkige mensen. Wij duimen voor jullie en zijn al benieuwd naar het vervolg. Groetjes van Annie en Willem. En weeral veel verschrikkelijke jaloezige mensen hier in Belgenland. Thanks! The longer we are travelling around the more we enjoy it 🙂 Greetings to Düsseldorf!